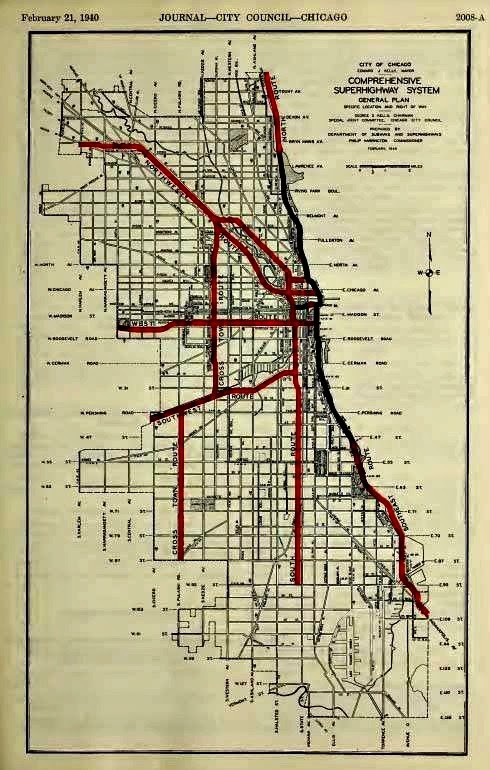 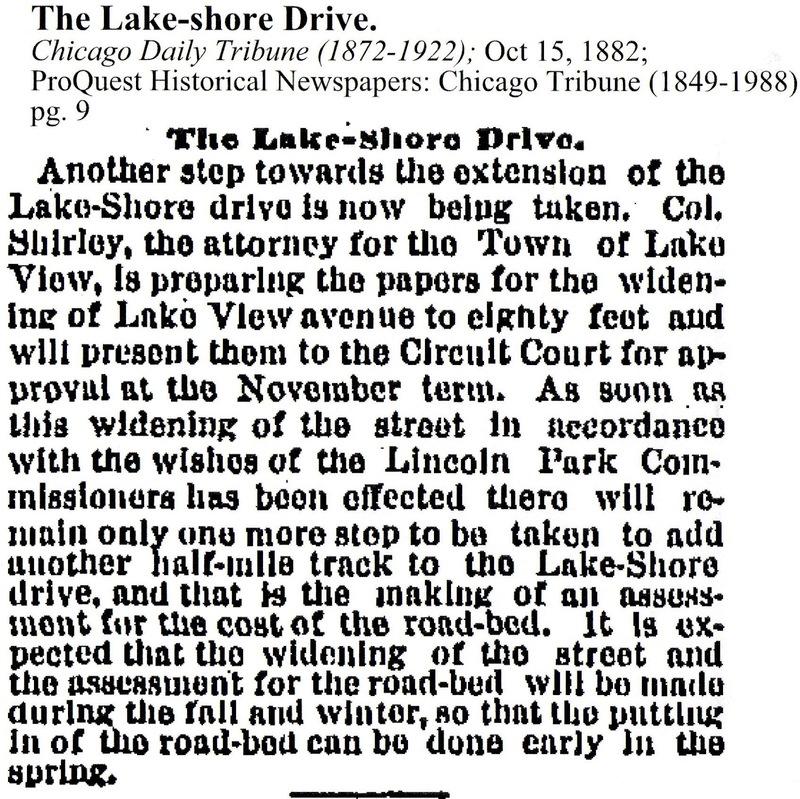 It was difficult for me to distinguish the story of two major roadways that route through Lake View particular during the 19th century when both North Lake-Shore Drive and Sheridan Road were planned for the future. 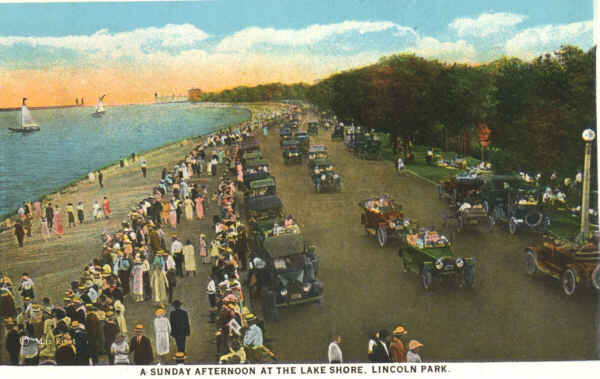 While Lake Shore Drive would eventually be routed through most of the City of Chicago along the existing lake shore, Sheridan Road would be routed from the northern tip of Lincoln Park, the park to Milwaukee, Wisconsin closely linked to the existing lake shore in only few areas of Illinois and Wisconsin. 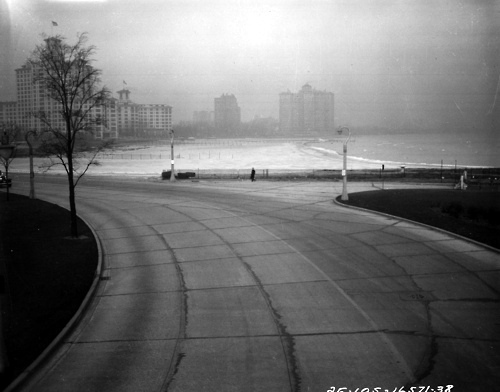 Lake Shore Drive & Sheridan seem to merge at one singular area of the City of Chicago – Lake View from Belmont Avenue to just north of Grace Street. 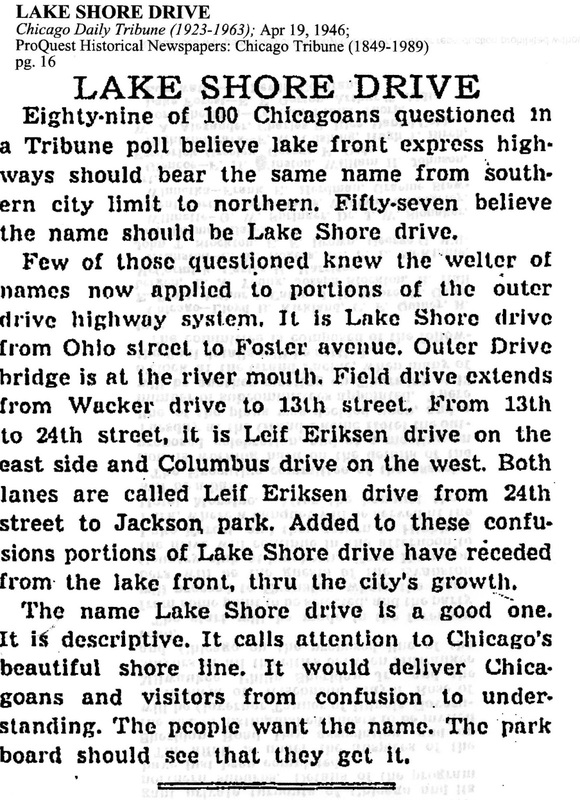 Names changes complex the story of both roadways particularly in Lake View. 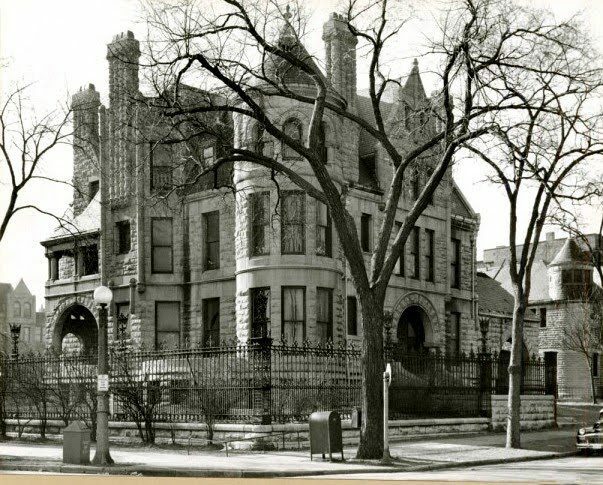 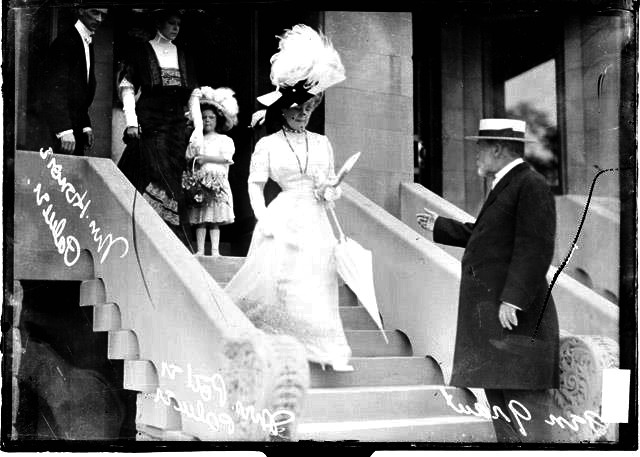 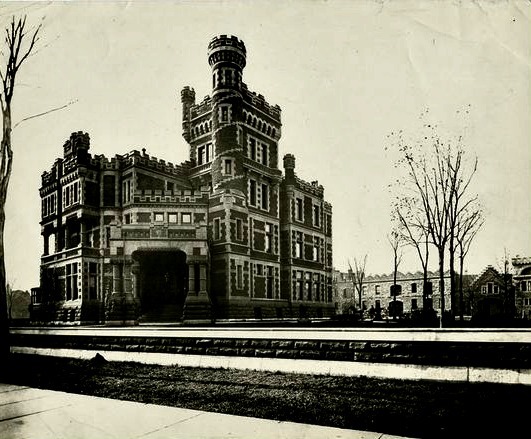 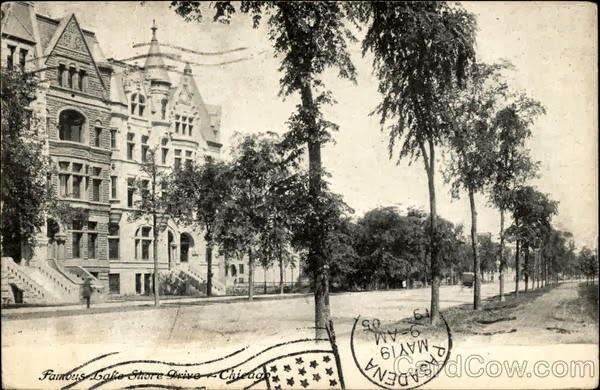 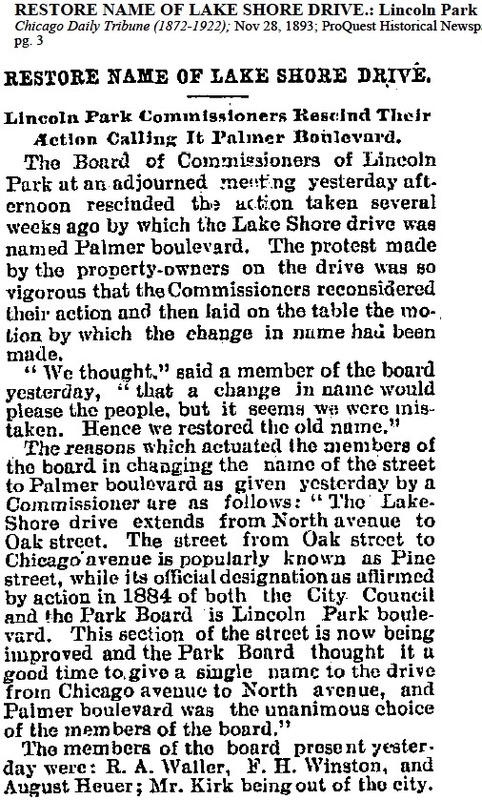 After the death of General Sheridan, the city council honored him by changing the name of North Lake-Shore Drive (correct spelling at the time) to Sheridan Road while Lake View Avenue became Sheridan Road from Diversey Boulevard to Belmont Avenue by the late 1890’s. In 1931 Sheridan Road from Belmont to just north of Grace would be called, once again, North Lake Shore Drive – locals call it inner Lake Shore Drive so to distinguish the outer drive from the so-called inner roadway. 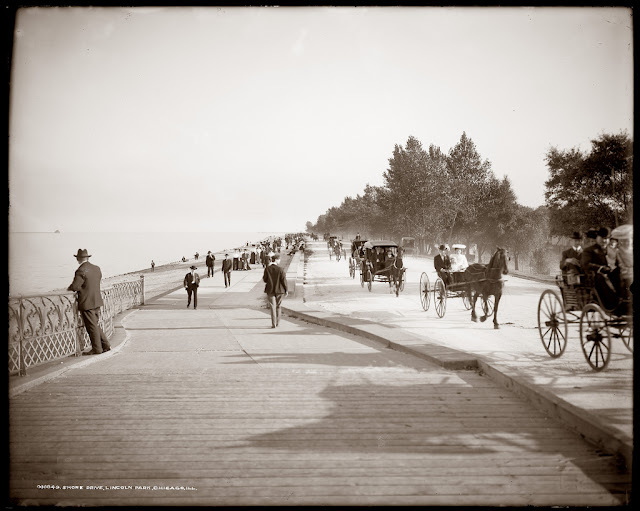 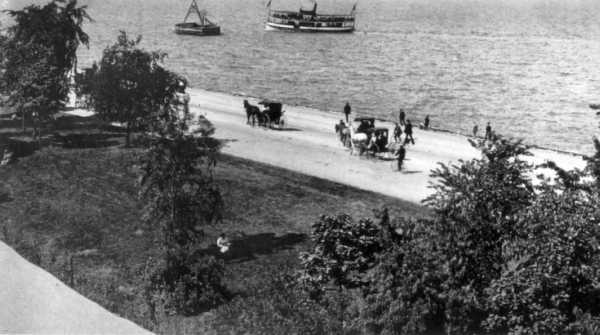 Both roads were meant for leisure travels with a horse & carriage and not for overwhelming traffic congestion of the modern automobile; trucks are banned on Lake Shore Drive. 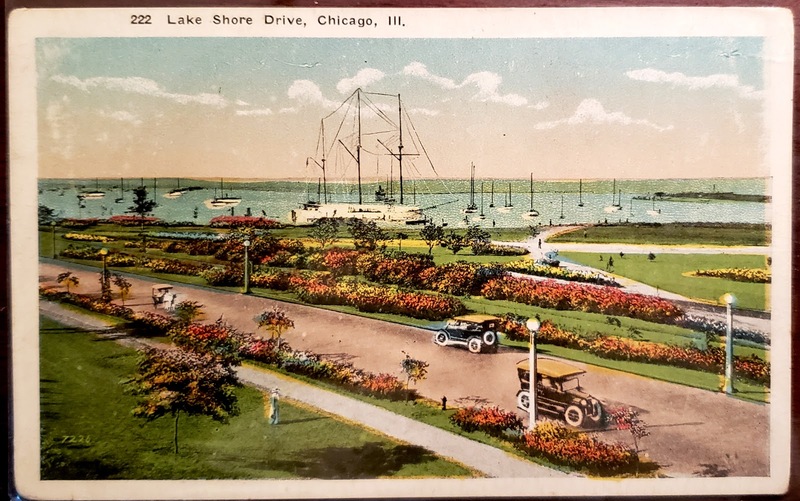 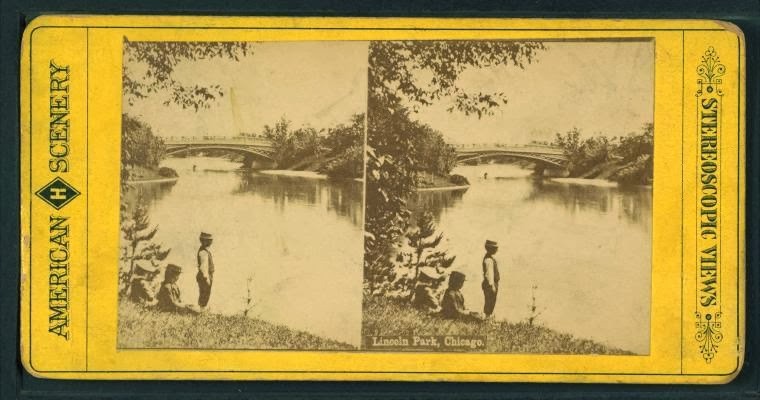 Lake Shore Drive began as a self-interest desire of a man who dominated the business community in Chicago throughout the mid to the late 19th century owning most of the property on State Street. 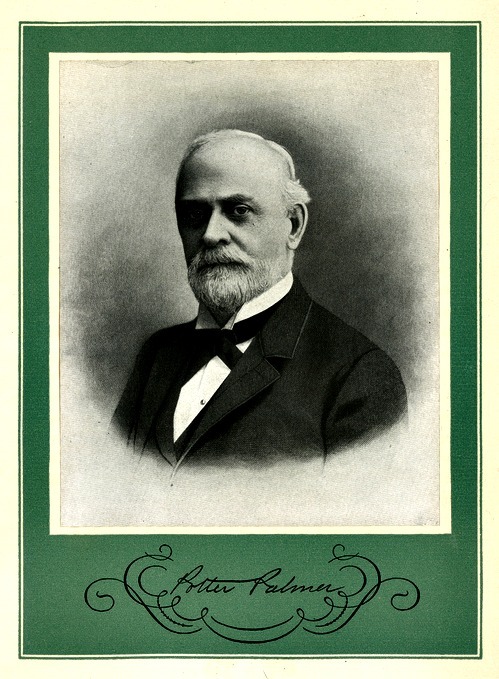 His name was Potter Palmer. 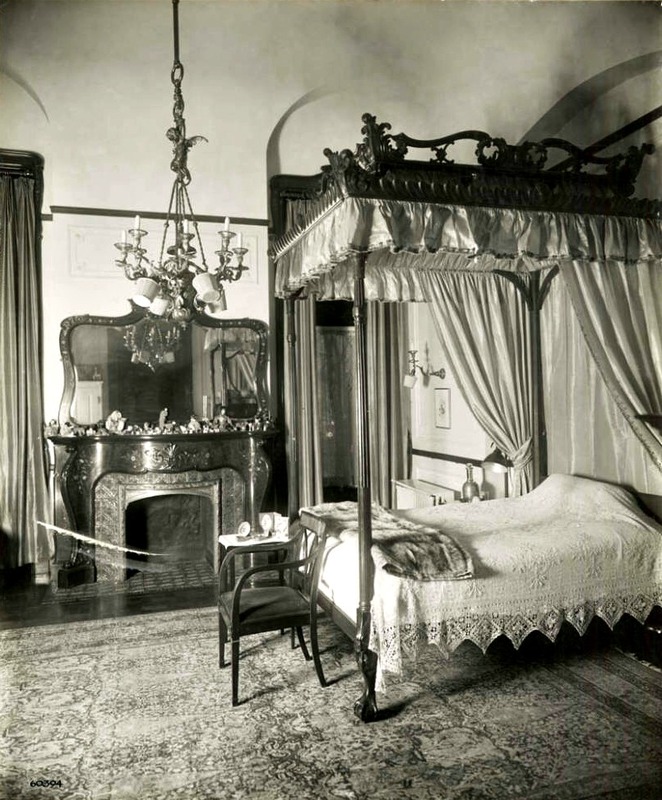 His wife, Bertha Honore, was a personality of her own right. 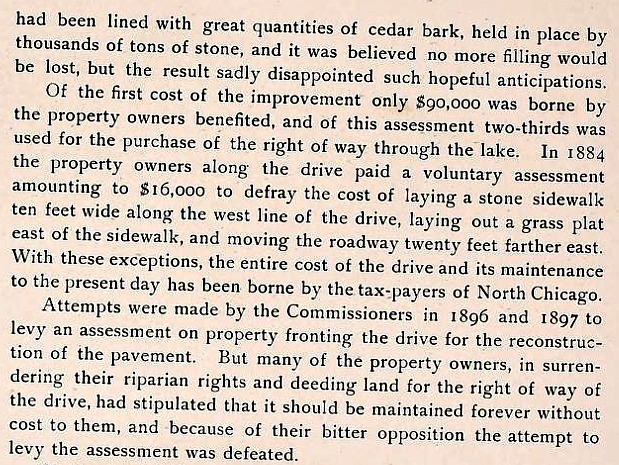 this is an excerpt highlighting the LSD during the 1850's. 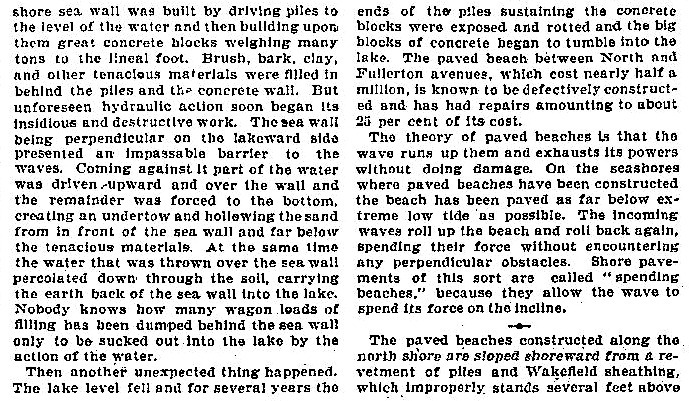 The word used - planks were indeed what they were - wooden strips laid next to each other on a former earth trail. 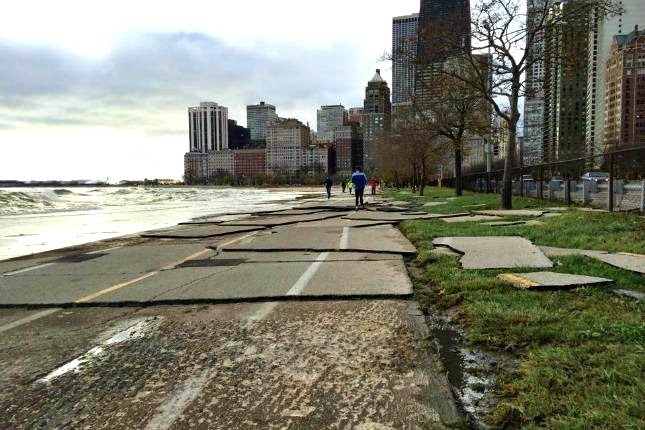 Planks would also be used as sidewalks. 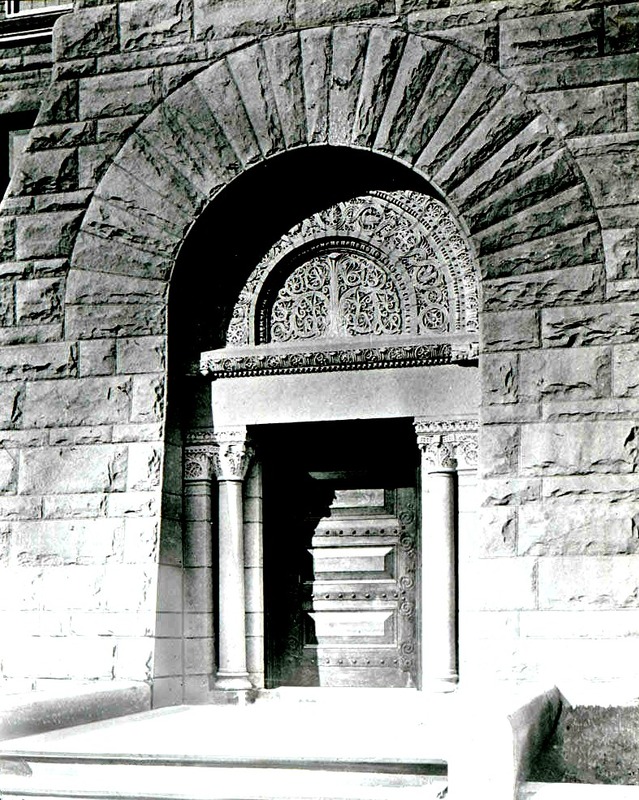 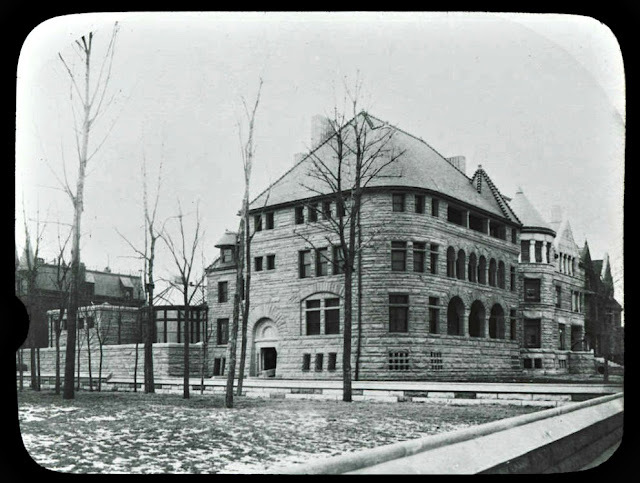 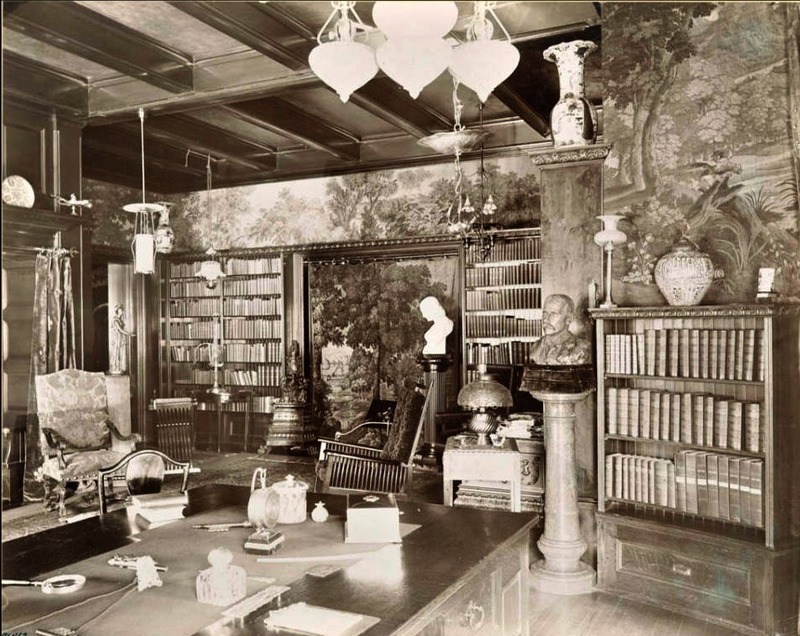 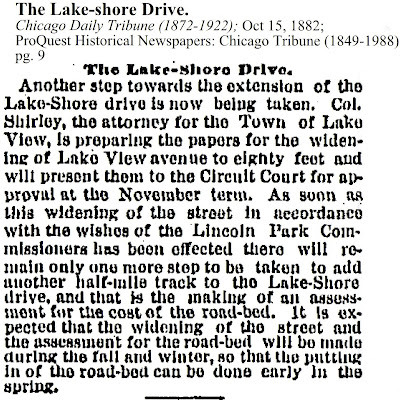 I will try to map out an evolution of the first Lake Shore Drive that began at the Palmer Potter Estate to Lincoln Park, the park and then to Grace Street in Lake View Township. This journey involved a Midwest storm in 1929 that destroyed the original road and lakefront property. 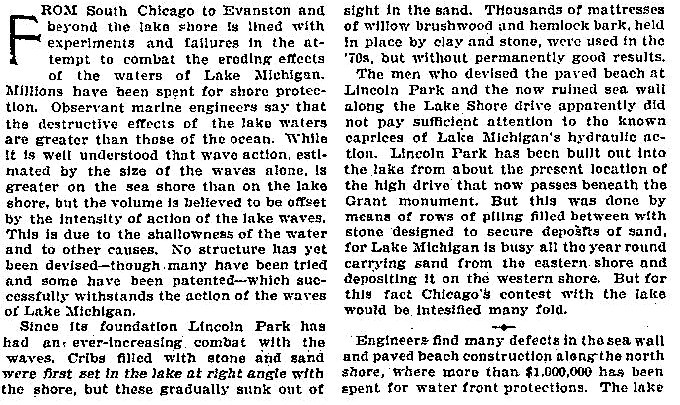 From that storm (there were two that year) and from Great Depression a new and wider/longer Lake Shore Drive would emerge. 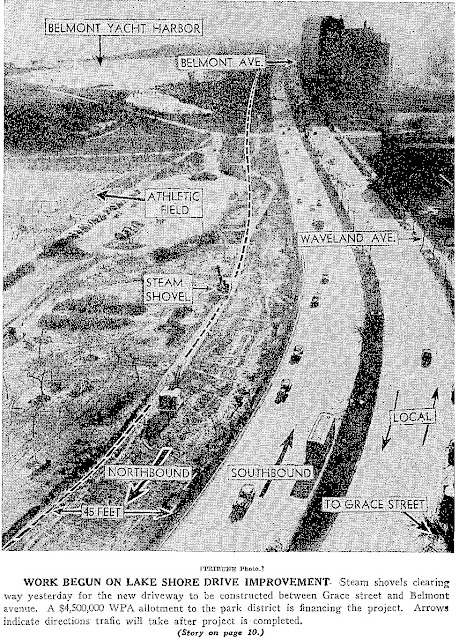 The evolution of the Outer Drive still continues with plans to extend it further south as well as re-inventing it for modern mass transit. 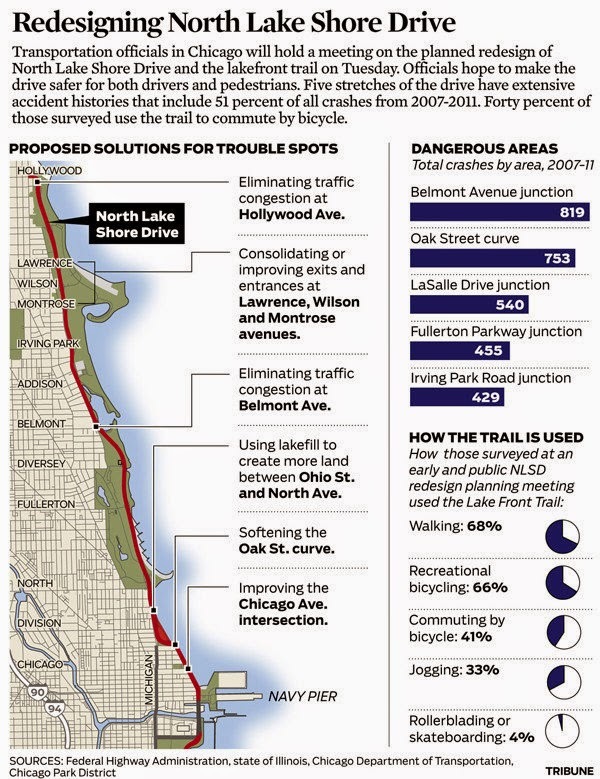 Linking the north and south version of the lakefront roadway would happen in the first during the first two decades of the 20th century. 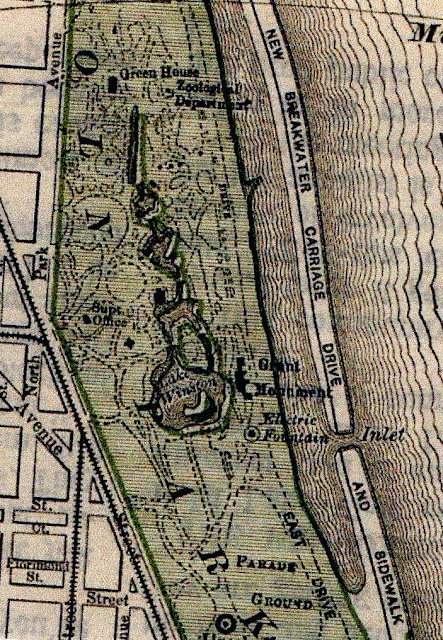 the map below highlights the Children's Bathing Beach (Lincoln Park Beach) that was initially meant only for women and children. The inlet was the beginning of the landfill and extension of the bathing beach and establishment of Diversey Harbor. 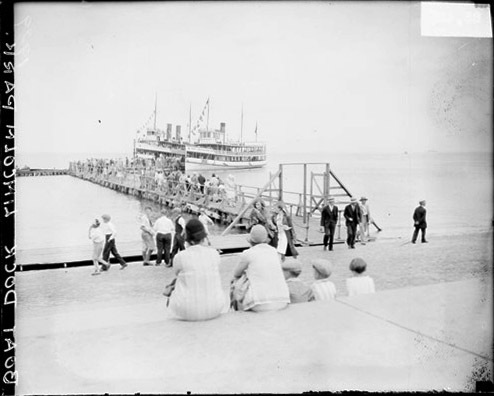 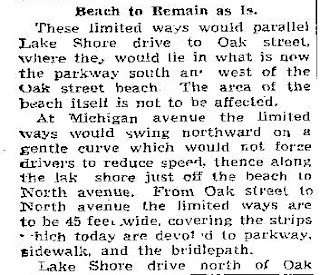 In the late 19th century until the Depression era of the 1930's North Lake-Shore Drive was piecemealed together. 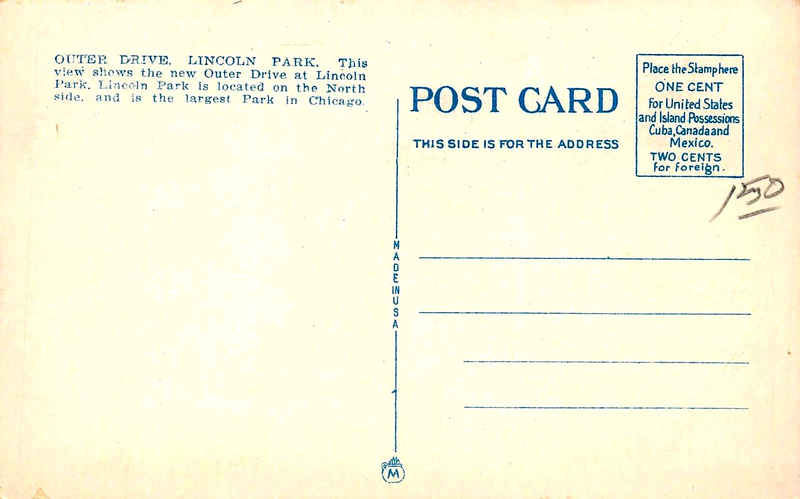 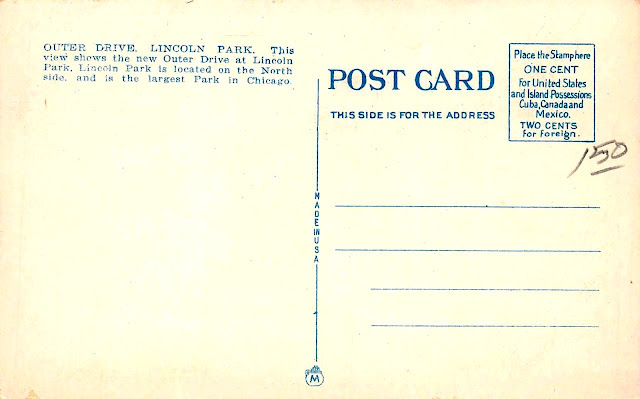 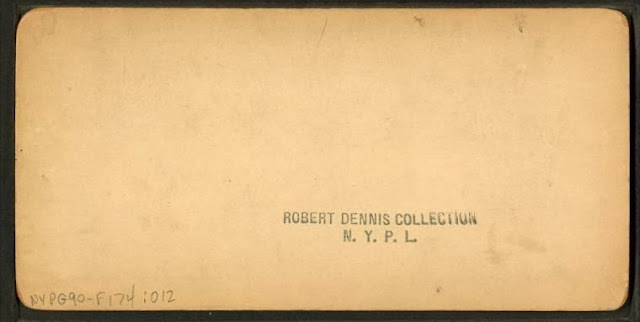 The most noticeable division was in the park, Lincoln Park. There was no direct route from south of the park to the north of the park. the meandering roads were narrow & meant for leisurely strolls and horse drawn carriages. 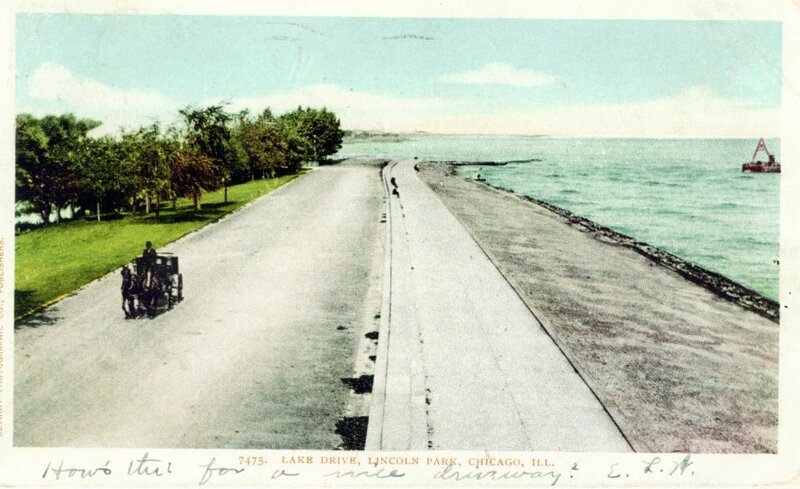 In fact, the park itself had its own version of a lakefront roadway interesting enough called 'The Outer Drive'. 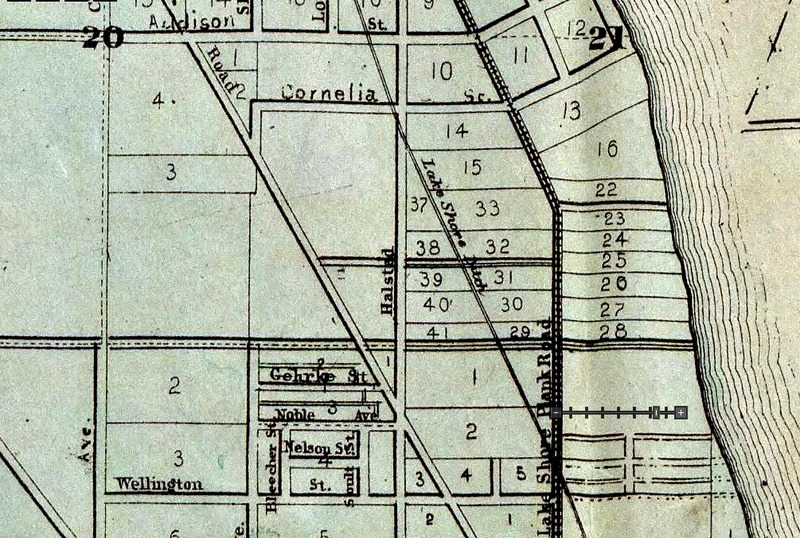 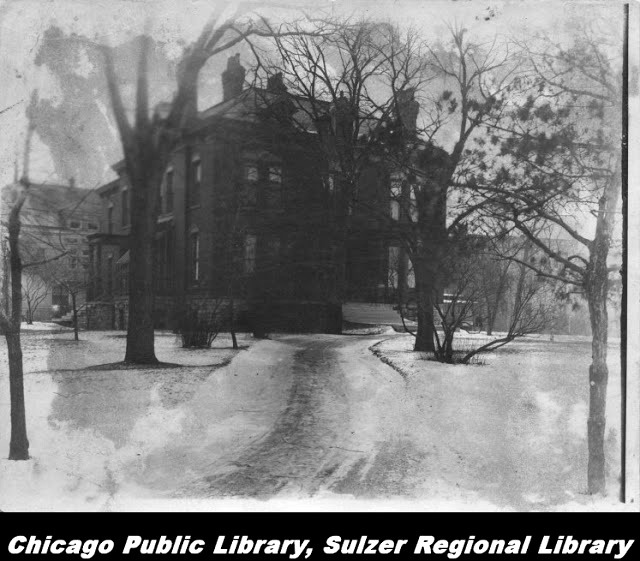 The encroachment into the park and into Lake View Township from Fullerton Avenue to Diversey Parkway allowed both representatives of both Chicago and Township (1857-87) and then City of Lake View (1887-89) to join the Lincoln Park Commission that was established by the State of Illinois in 1869. 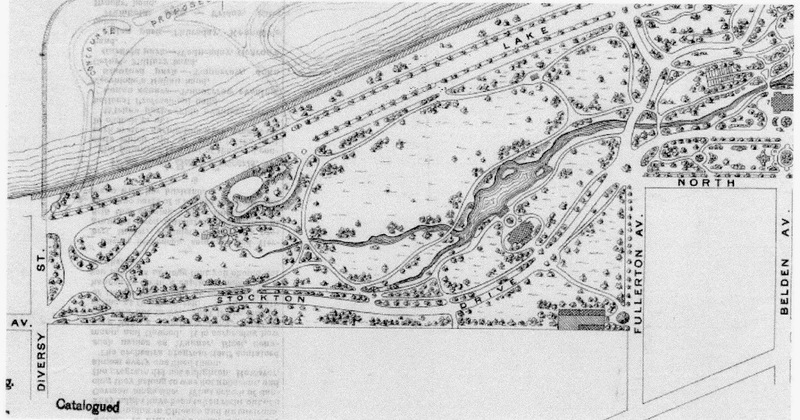 The commission mission was expand the park, Lincoln Park and the Drive northward. 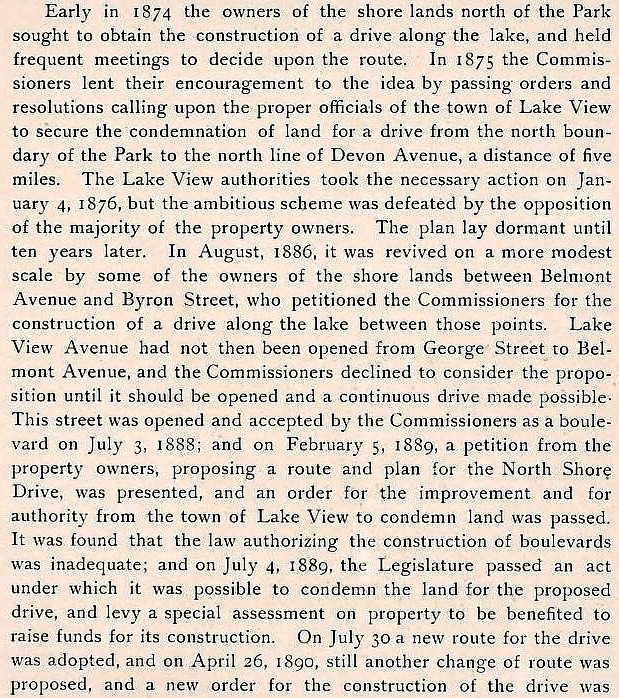 This commission was charged to negotiate with private lakefront landowners for permission to landfill along the existing shoreline and later construct Lake Shore Drive through and north of the park. 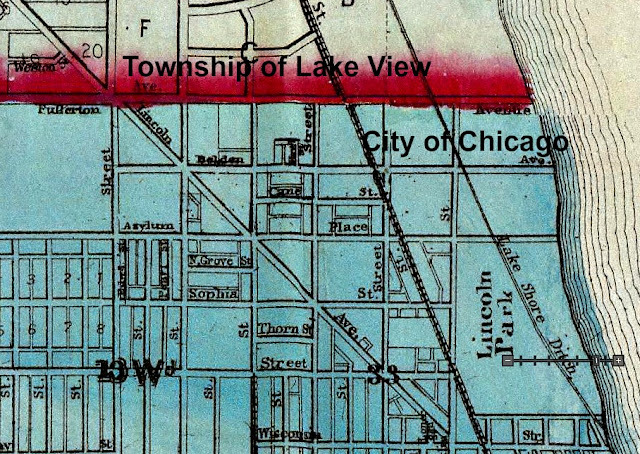 Below are some map images of the of the encroachment into Lake View Township. 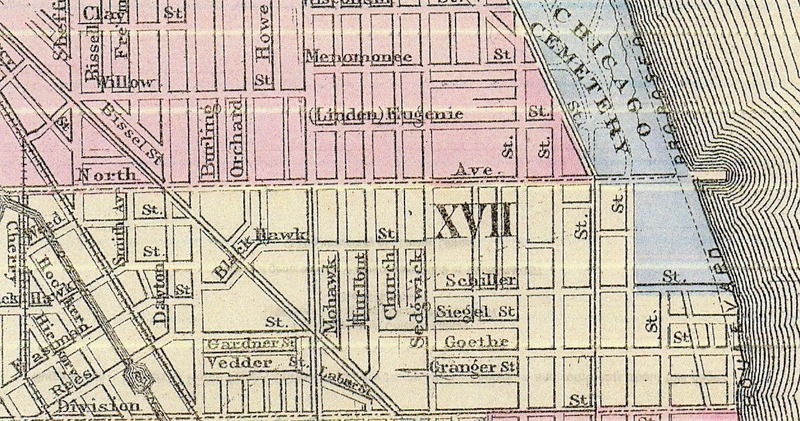 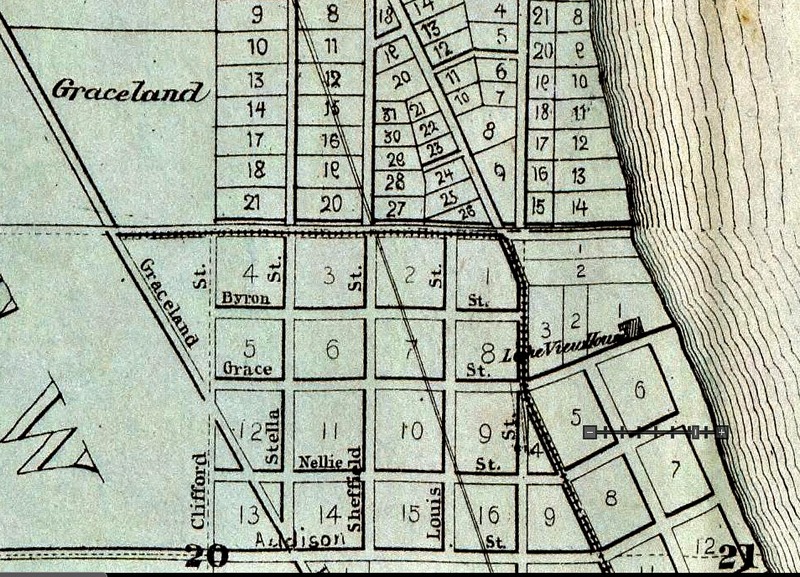 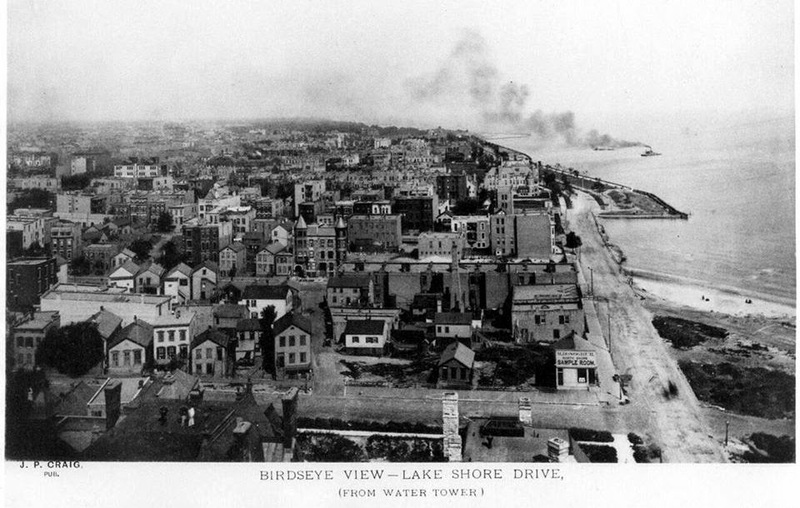 If you look on the right along the black wave (the lake) 'Boulevard Proposed' is marked indicating a planned extension road along the lakefront as of 1872. 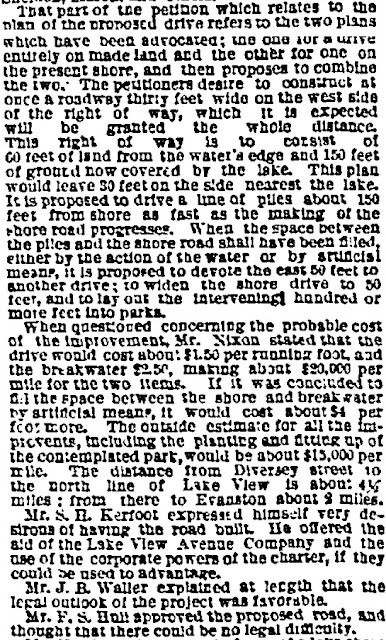 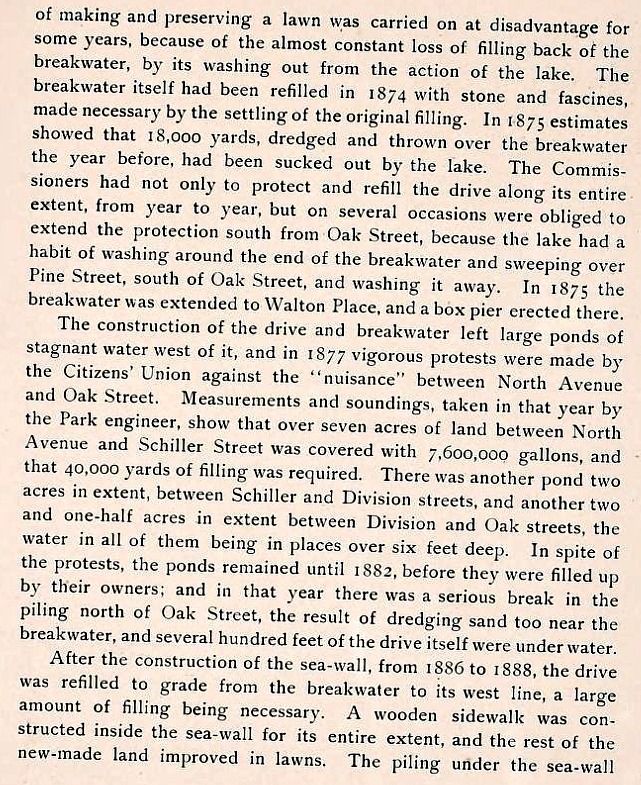 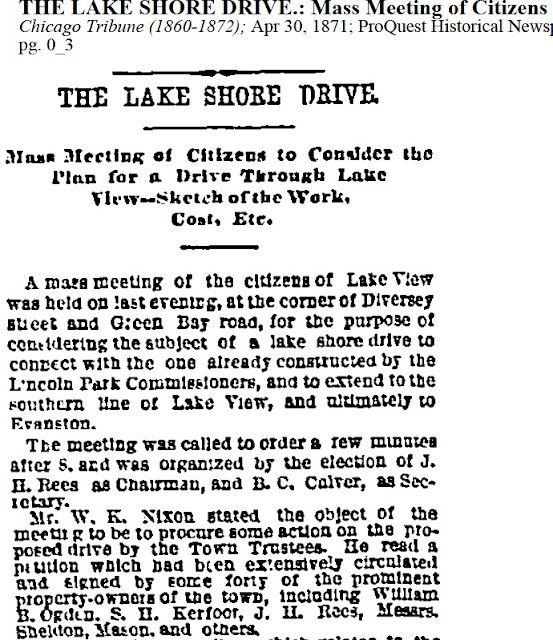 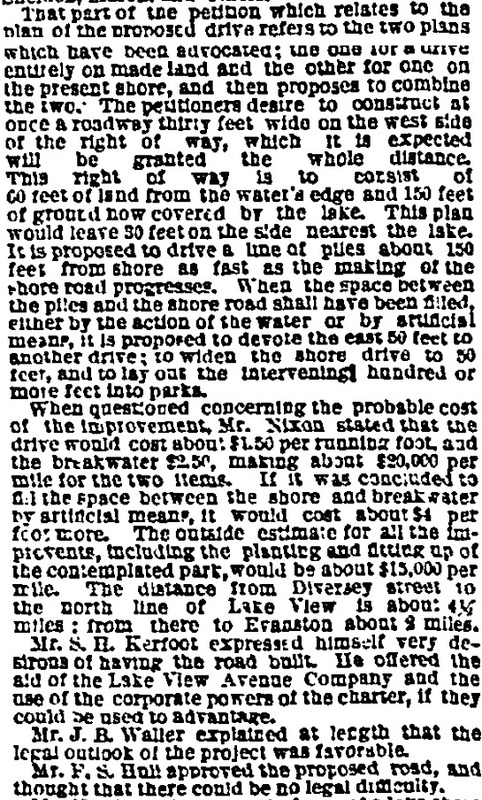 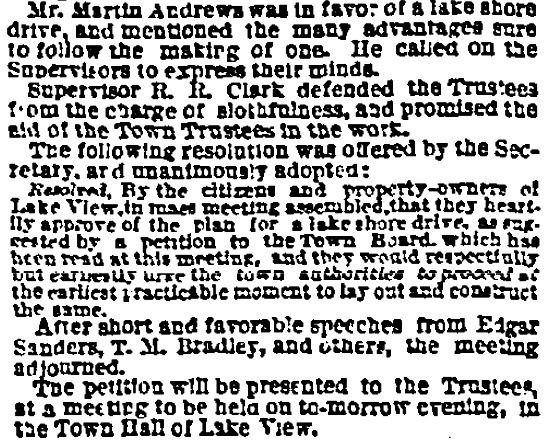 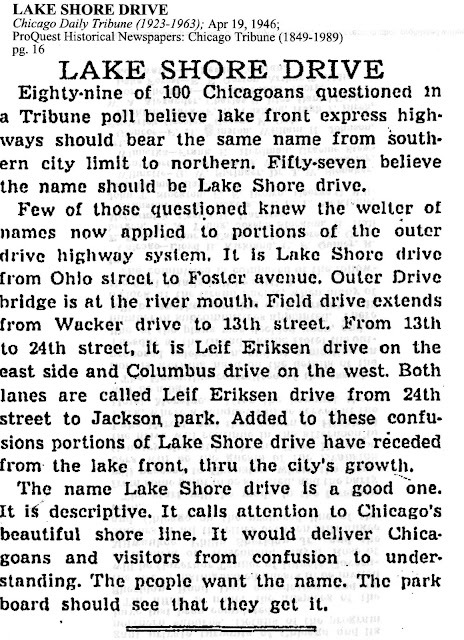 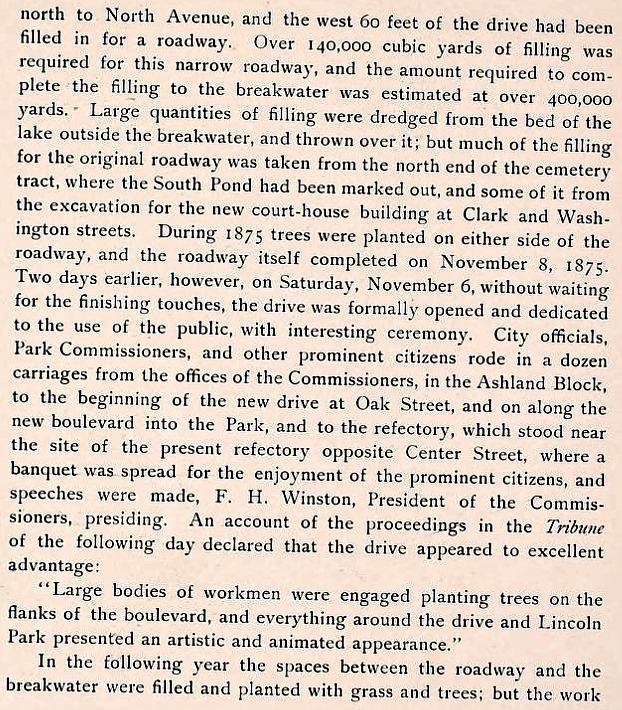 The Chicago Tribune article below indicates the Town(ship) of Lake View was interested in connecting North Lake-Shore Drive through the township via Lake View Avenue with a narrow strip of land-road called 'New Breakwater Carriage Drive and Sidewalk' - View the map below this article. 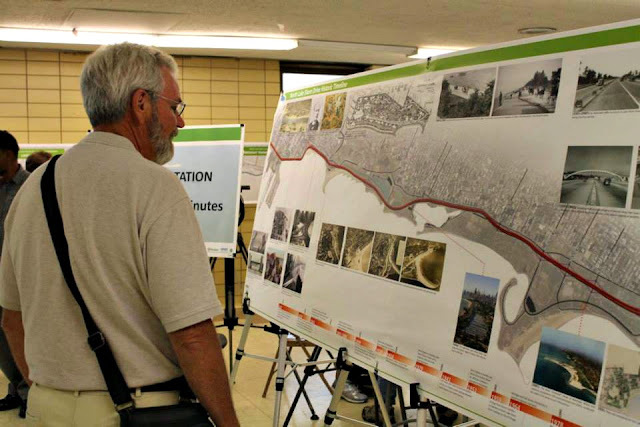 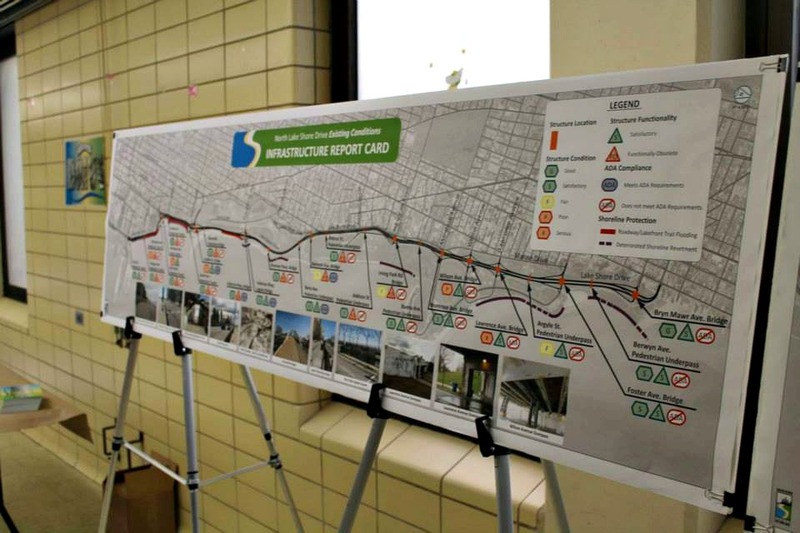 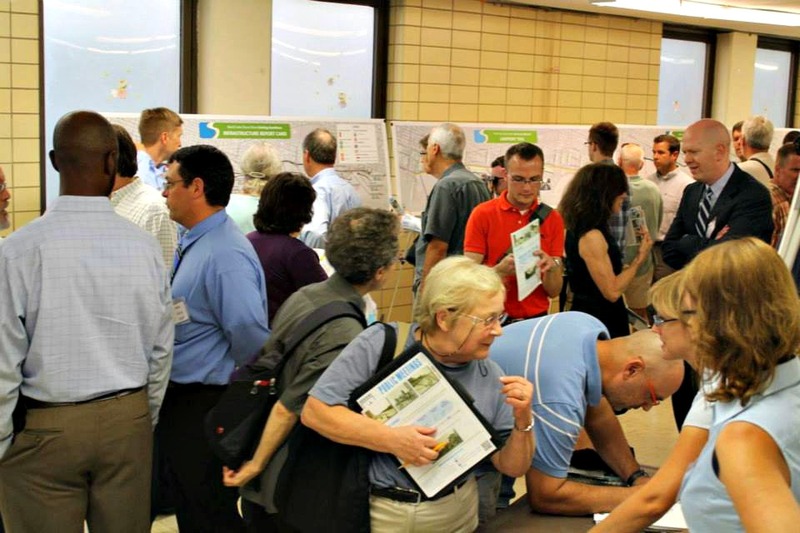 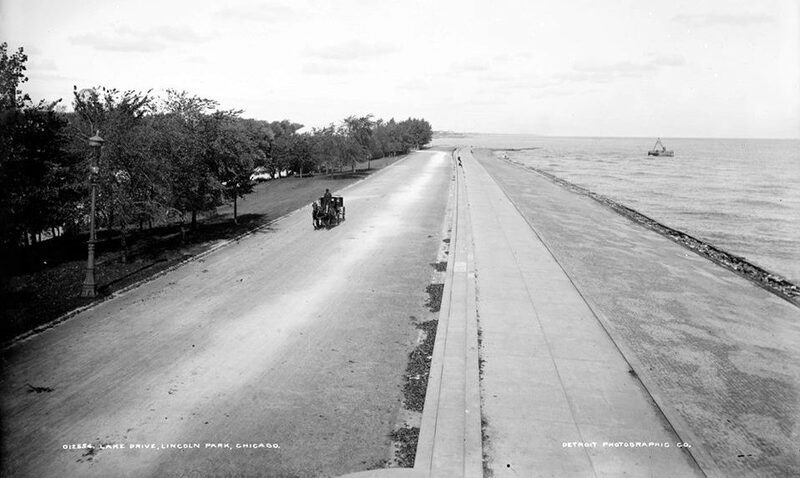 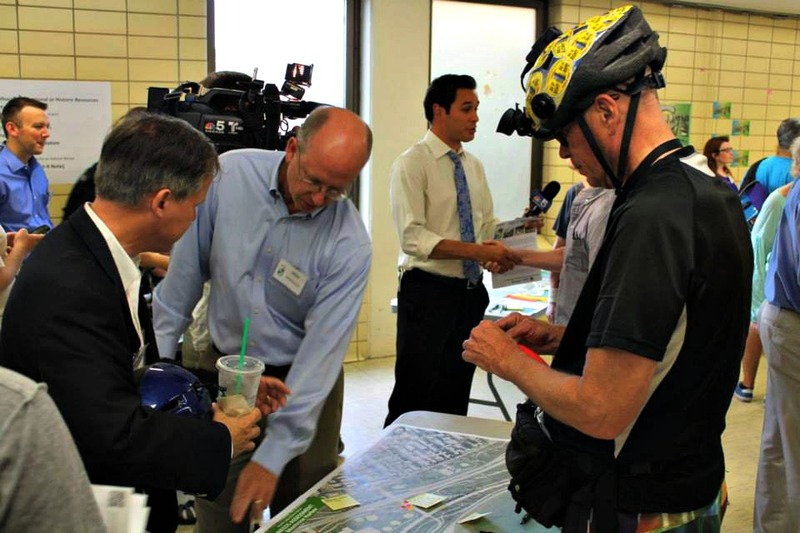 The original plan was to link Lake Shore Drive to Fort Sheridan in Haywood, Illinois. 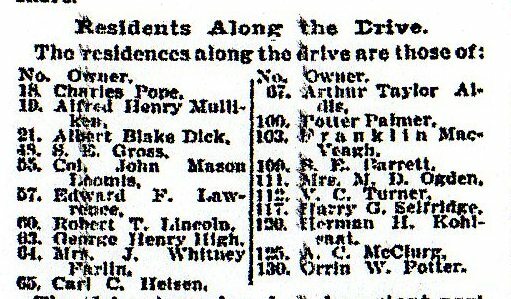 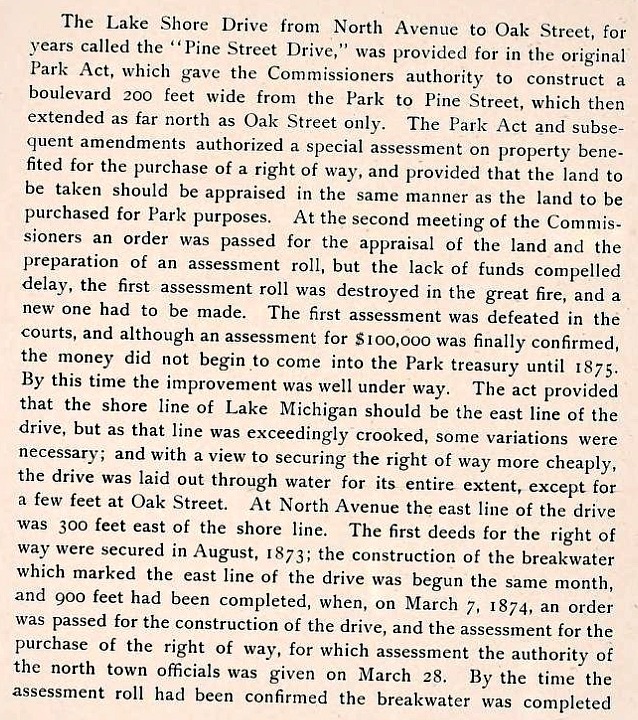 By 1893 this linked road from Lincoln Park north to Fort Sheridan was renamed in honor of General Sheridan who died in 1892. 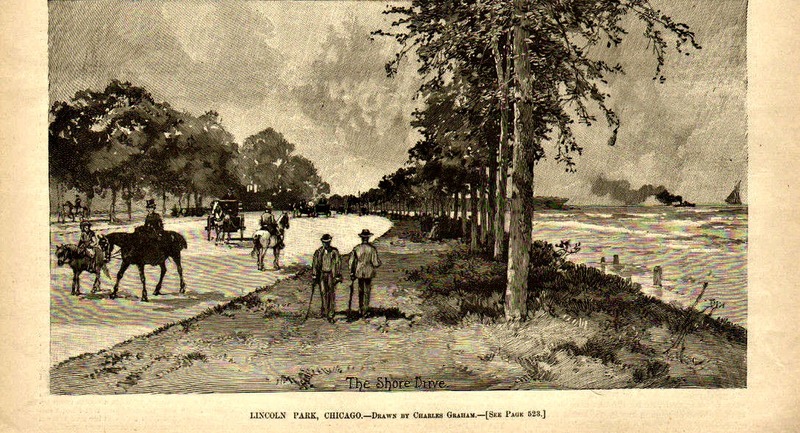 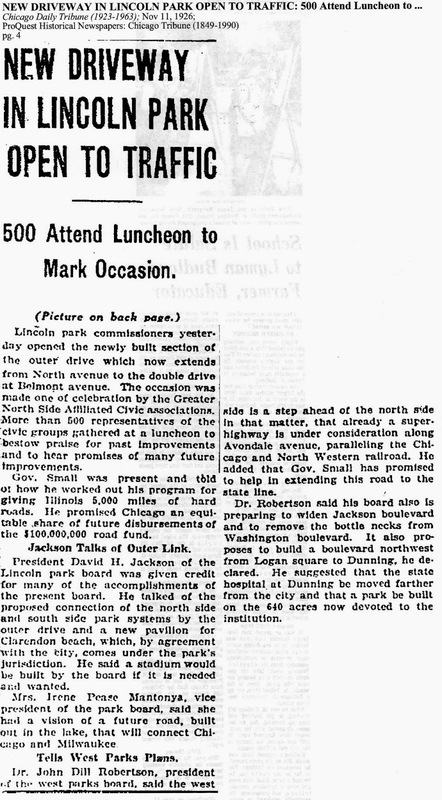 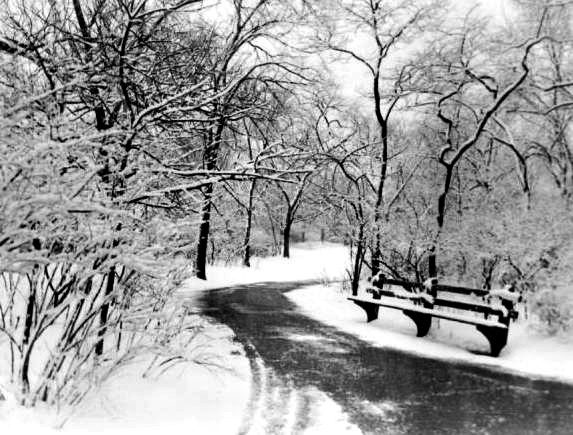 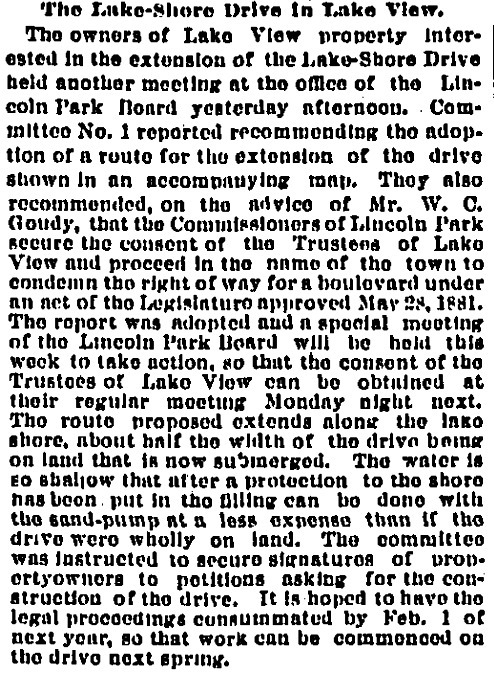 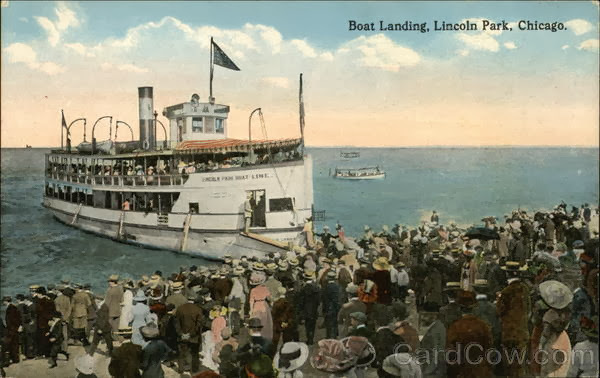 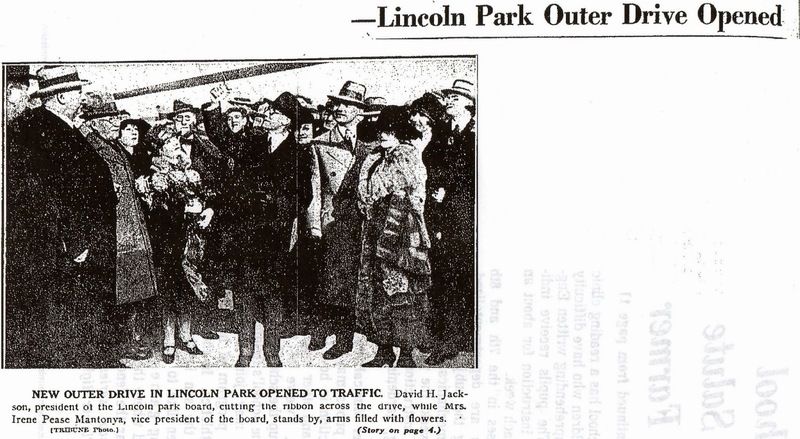 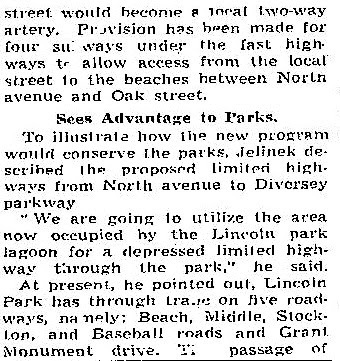 The Lincoln Park Commission had Board of directors from both the City of Chicago & the now District of Lake View to not only plan for the park's expansion northward but for the roadway that would be built along side it. 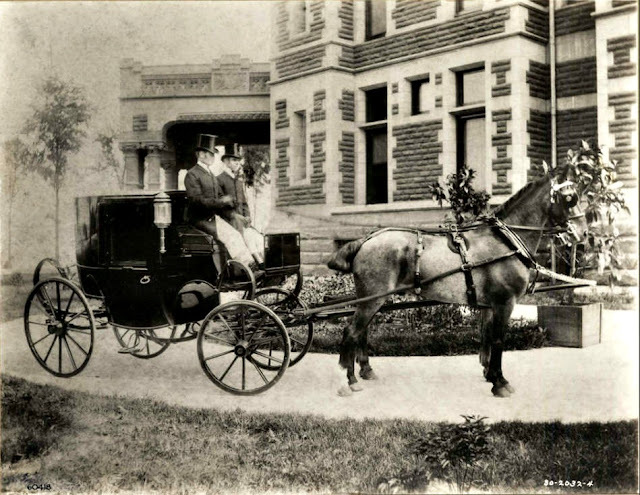 William Wrigley, Jr., chewing gum manufacturer & owner of the Chicago Cubs baseball team. 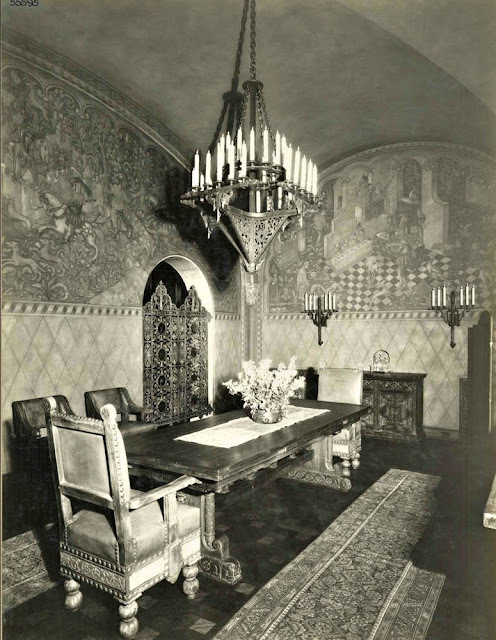 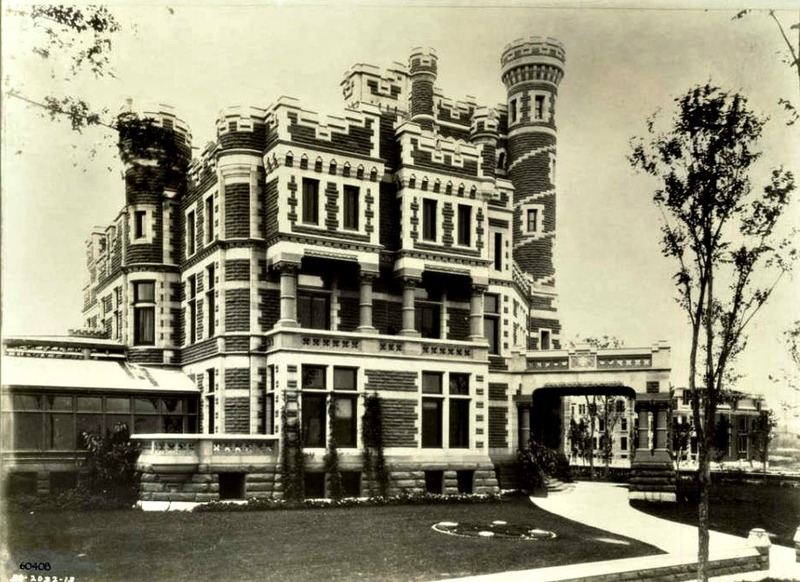 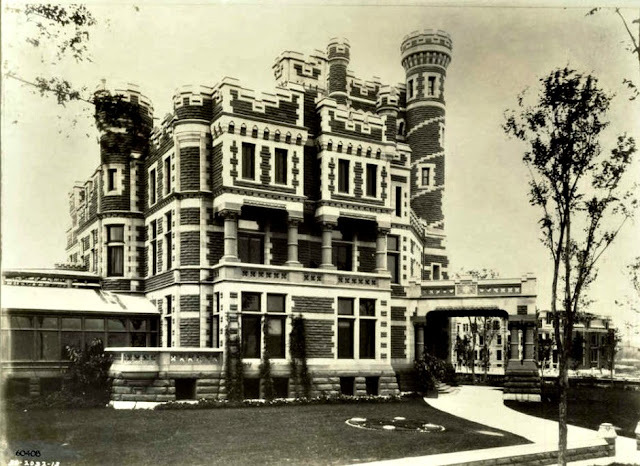 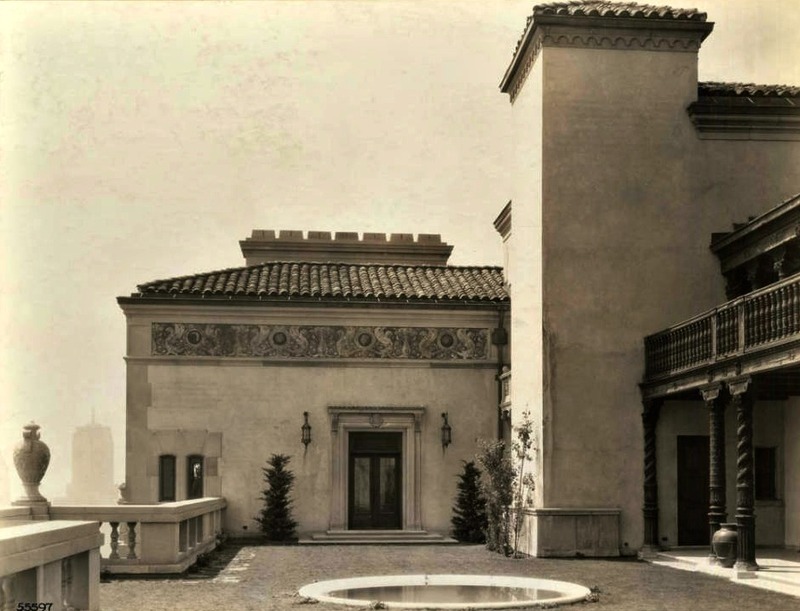 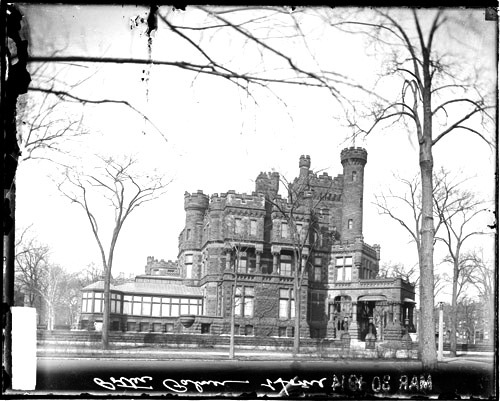 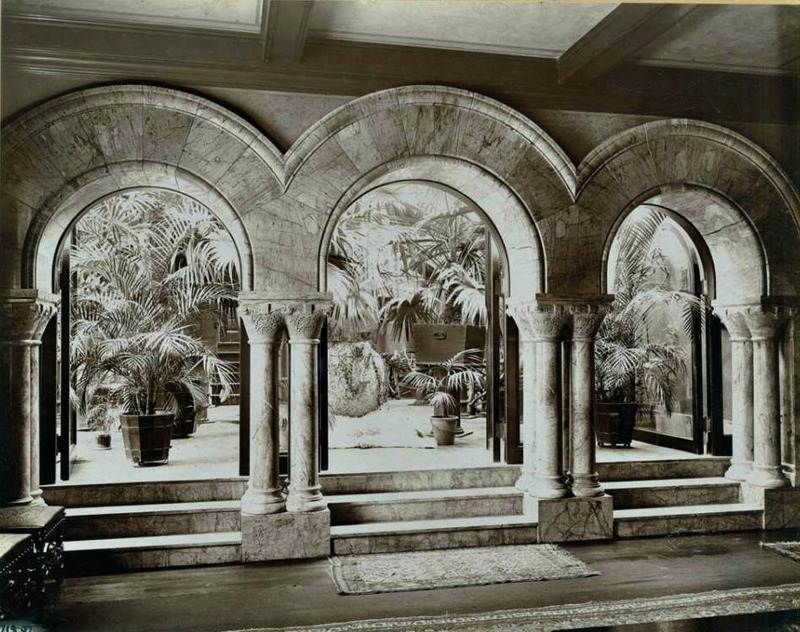 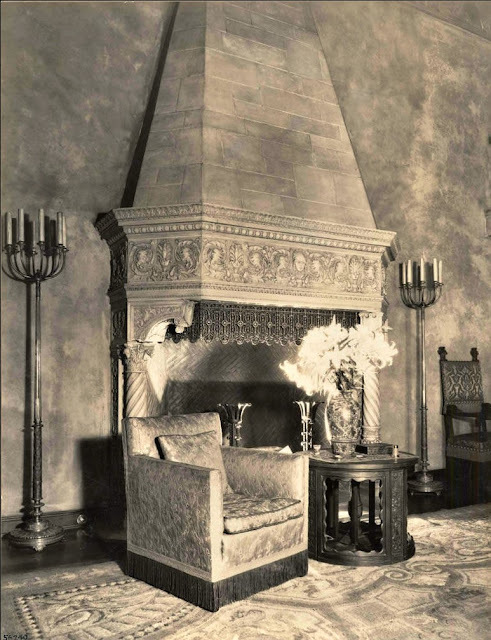 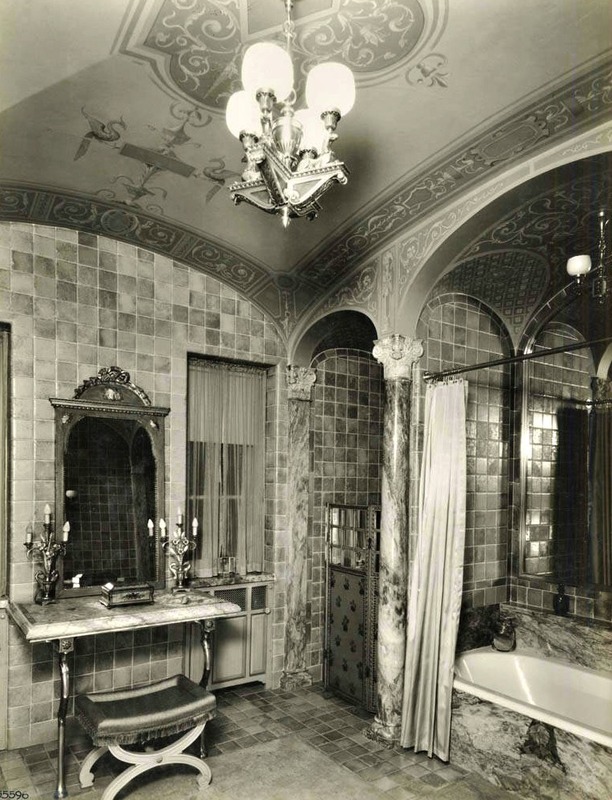 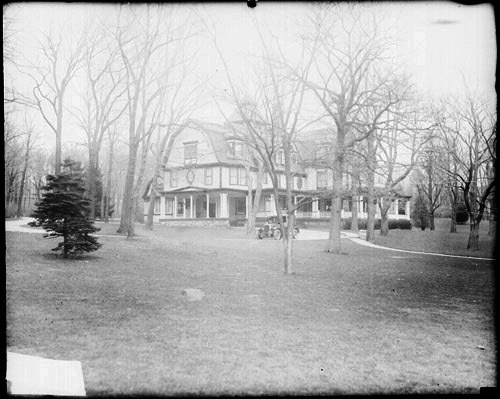 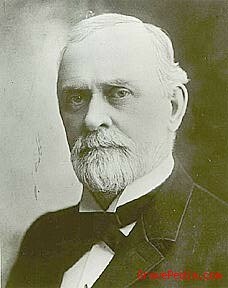 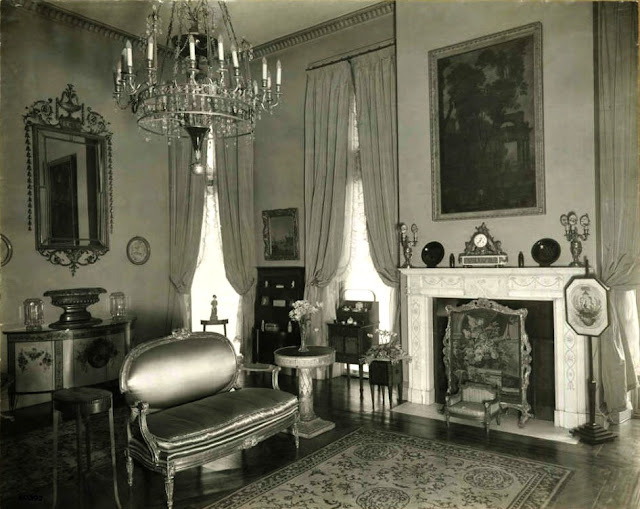 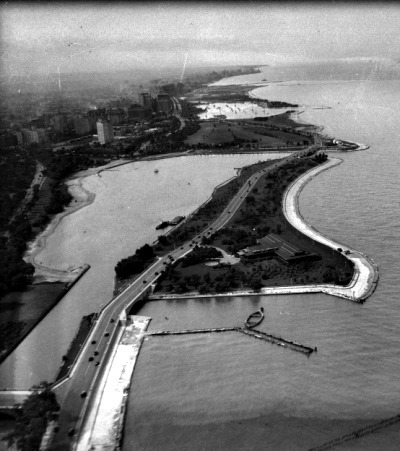 His family estate was located at 1200 North Lake Shore Drive. 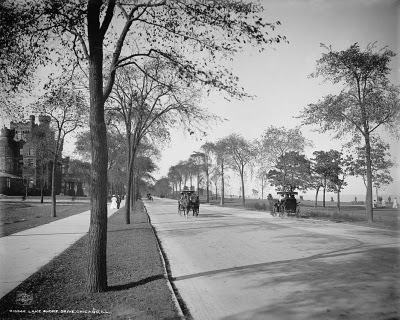 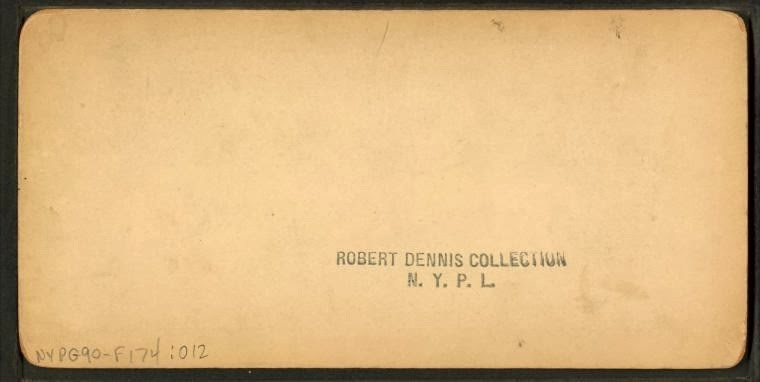 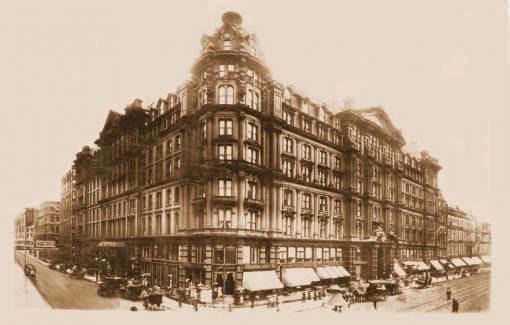 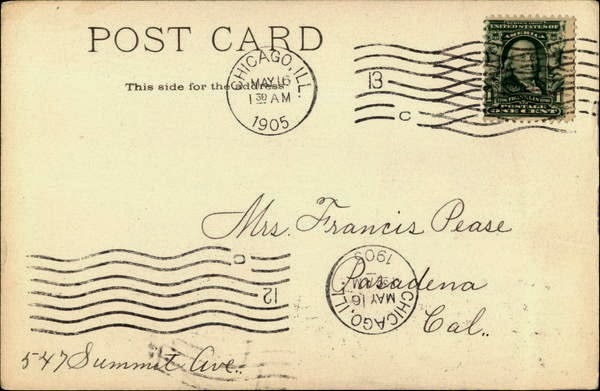 probably between Oak Street to North Avenue-1885ish? Notice the cobble stone street! 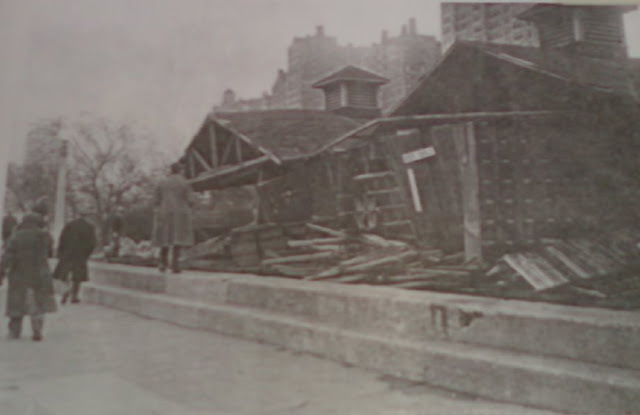 This fence extended apparently to Grace Street. 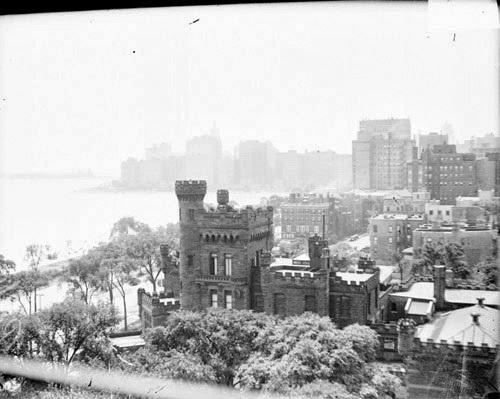 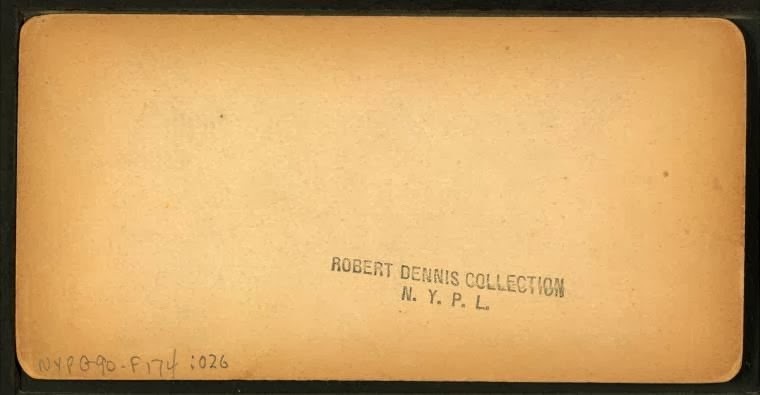 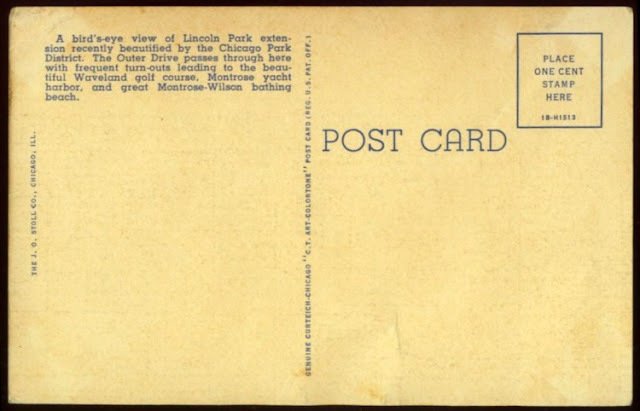 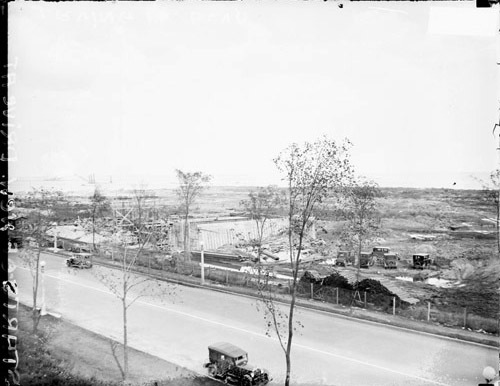 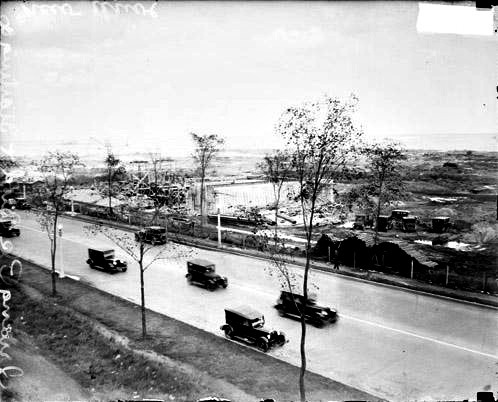 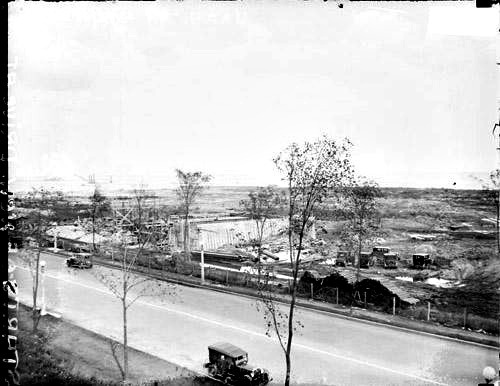 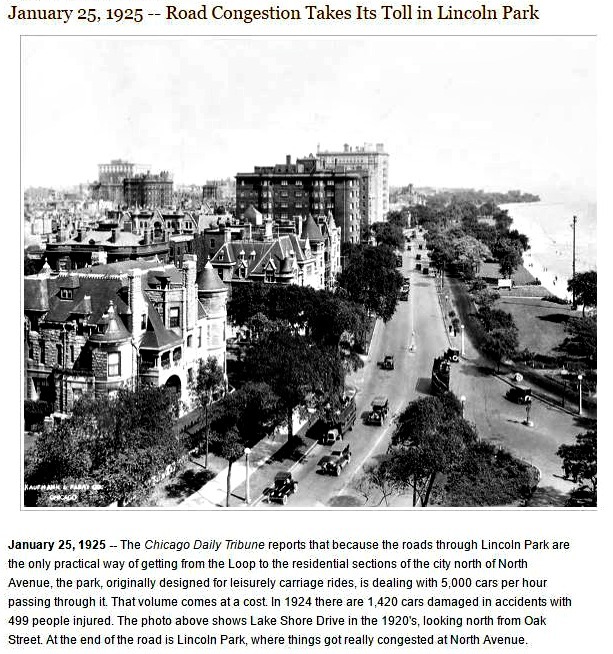 "park from North Avenue to Cornelia Avenue"
Before the Great Depression of 1929 the expansion of Lincoln Park landfill ended at Montrose Avenue minus the harbor. 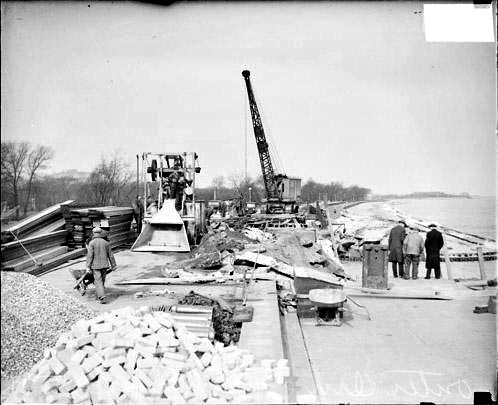 When the Depression engulfed the nation the construction and development project took a pause for a few years. 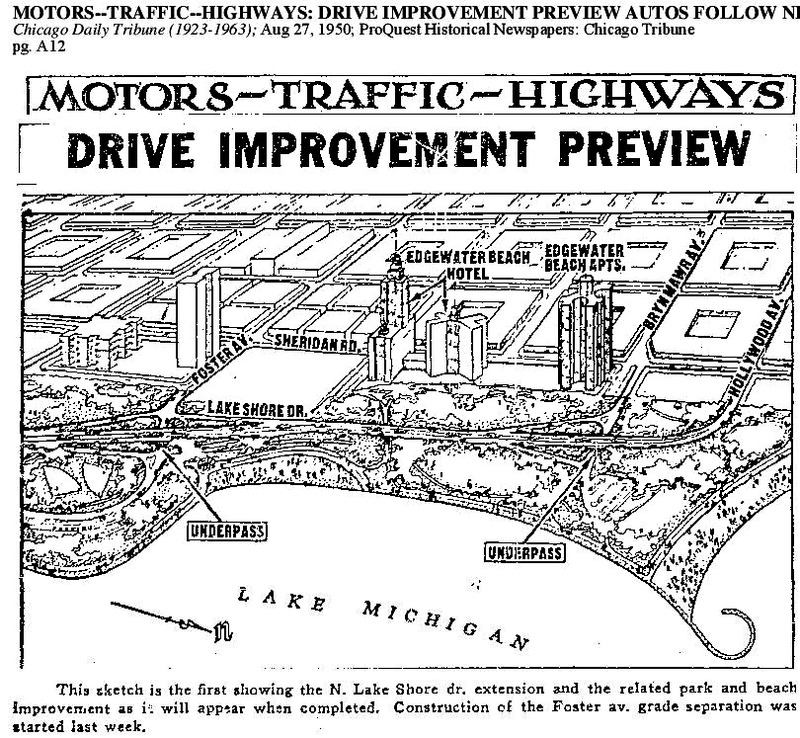 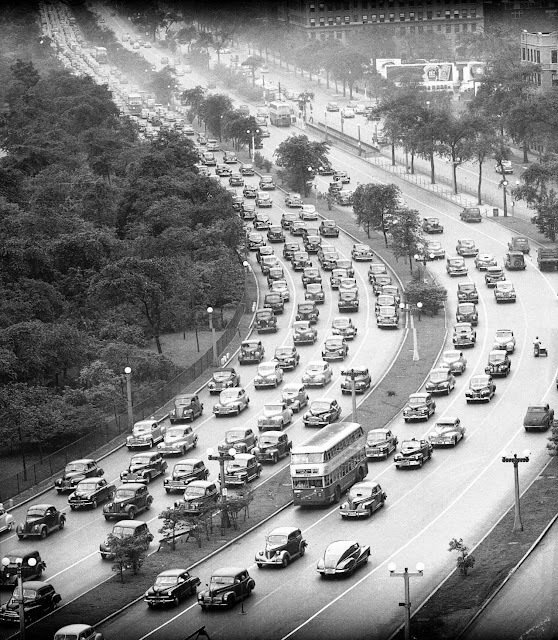 The expansion of North Lake Shore Drive would again begin in earnest after the worst of the Depression was technically over ... between the years of 1937-1942 with stimulus monies from the federal government (WPA). 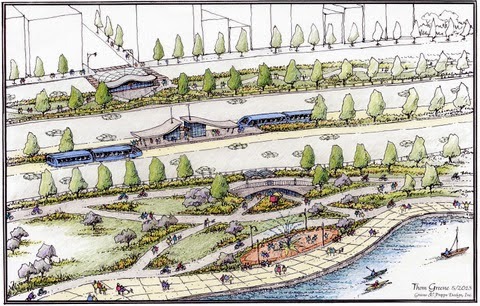 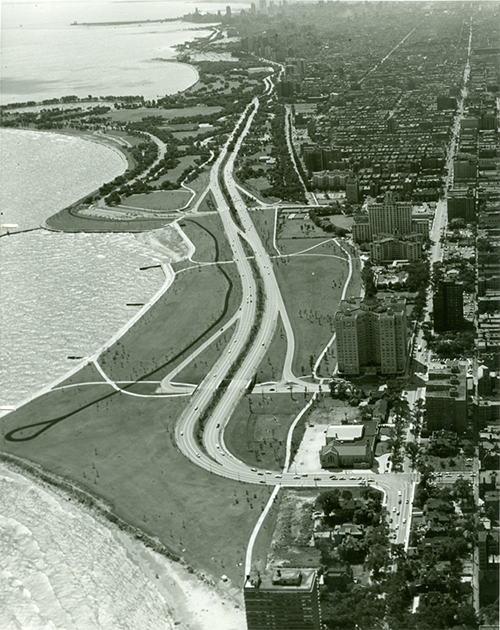 This five year project would also created a newer Drive along the lakefront and a newer designed park, Lincoln Park. 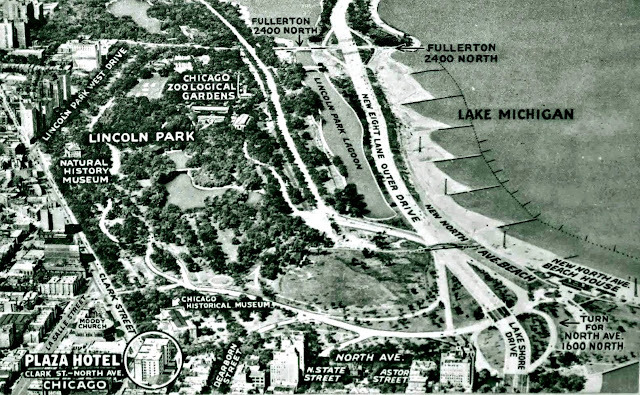 This is the best & enhanced edited view I have seen of landfill formation for the outer drive & the park space. 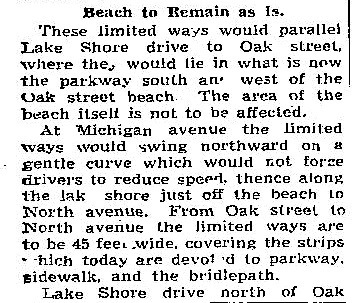 The beach at the end of the Drive was called Clarendon (public) Municipal Bathing Beach that adjoined Wilson (private) Beach just directly north of Montrose Avenue. 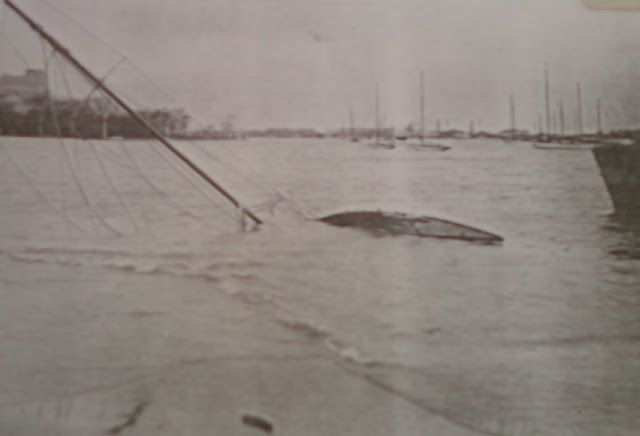 somewhere near Montrose - guessing? 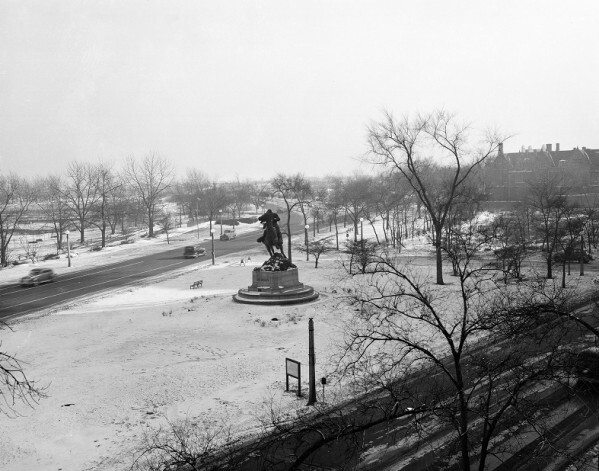 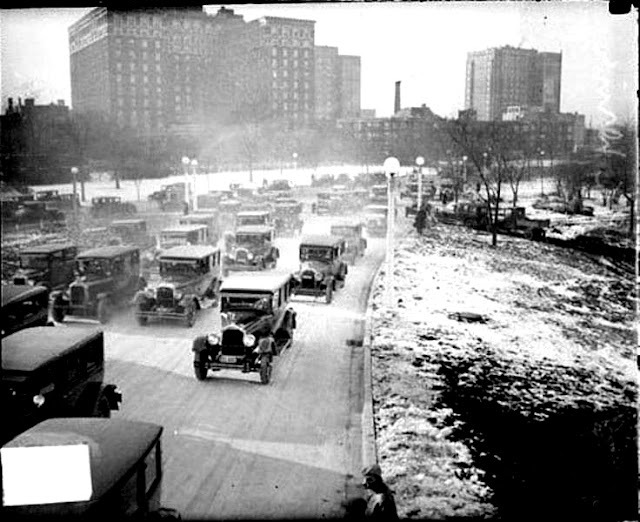 Lake Shore Drive was hit by a 'one-two punch' in 1929. 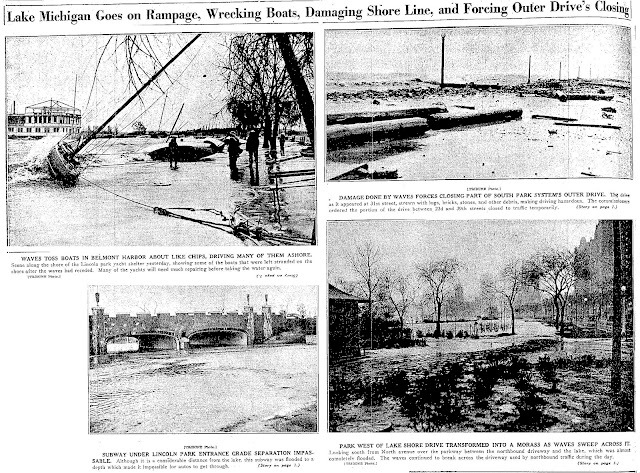 First came a severe storm in April and then another in October and then came the October economic collapse of the Great Depression. 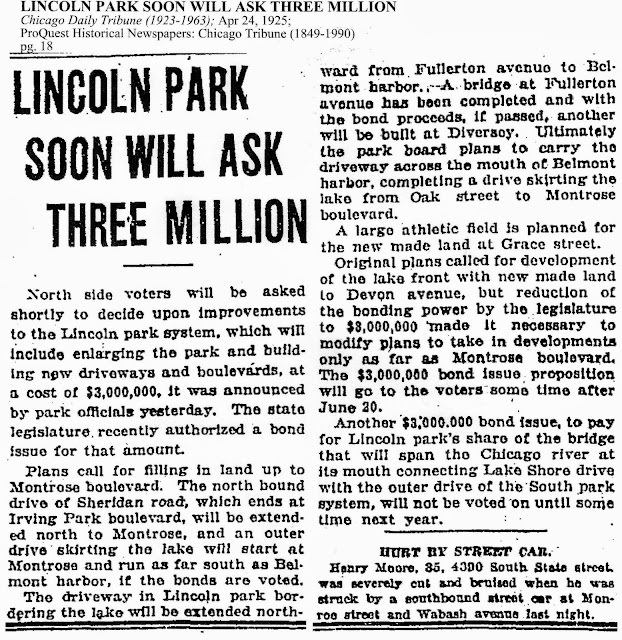 That year the Drive was destroyed and land-fill expansion north of the park was at a financial stand-still. 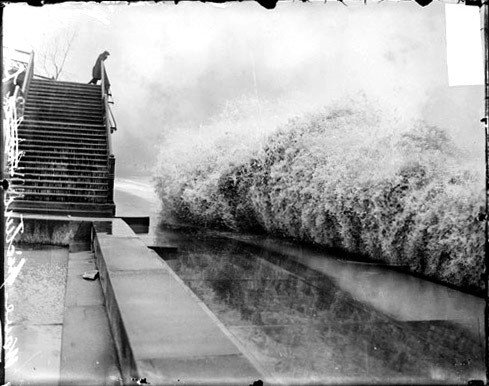 A two major storms hit the lakefront in 1929 in the Midwest & in Chicago - the October storm was the worst. 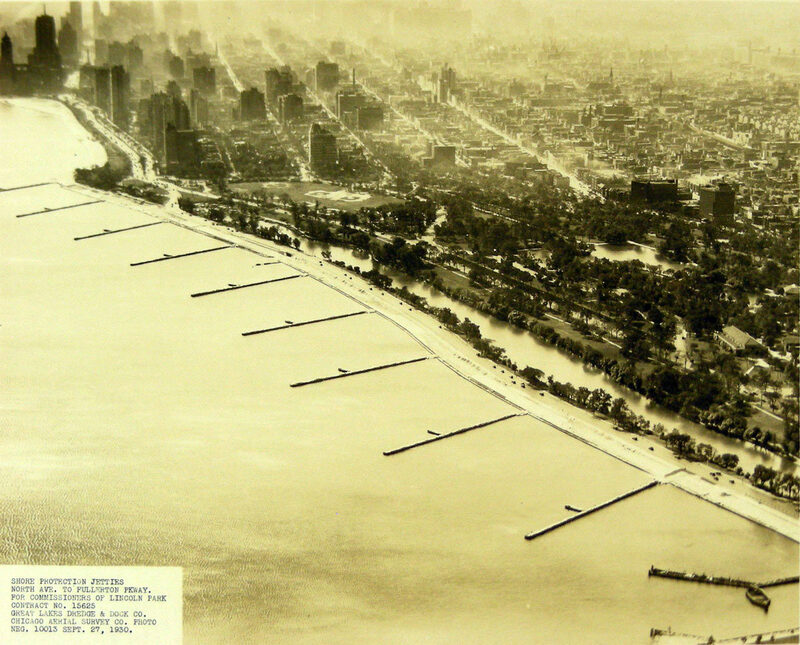 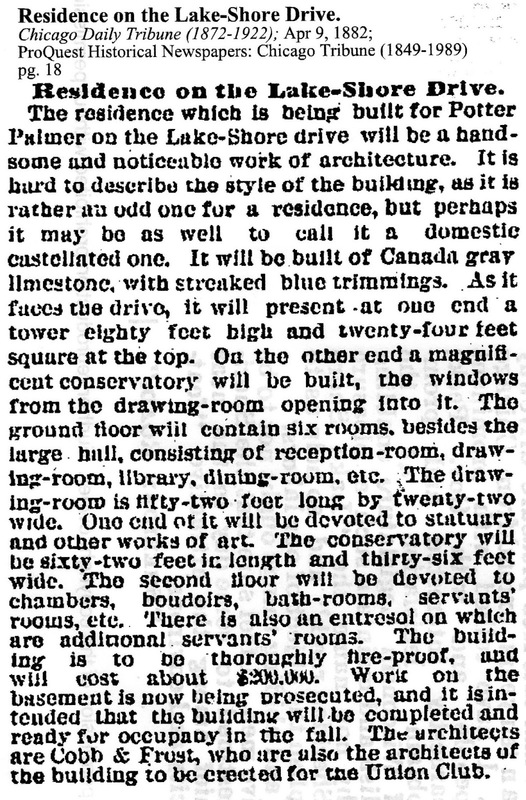 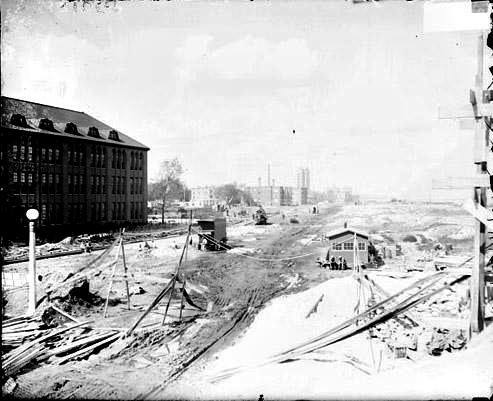 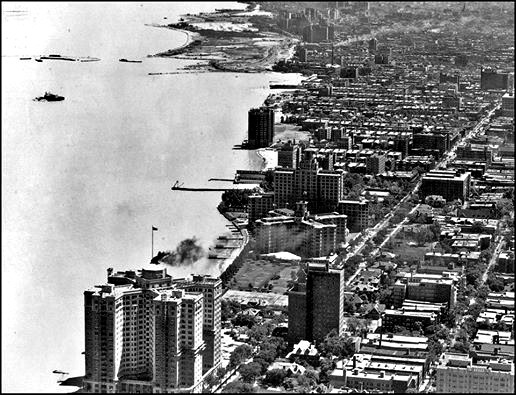 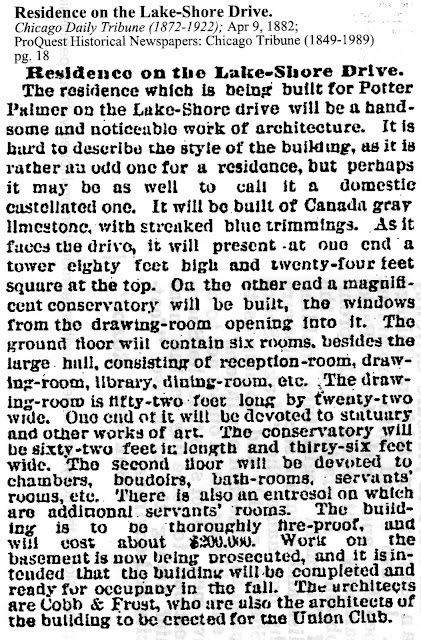 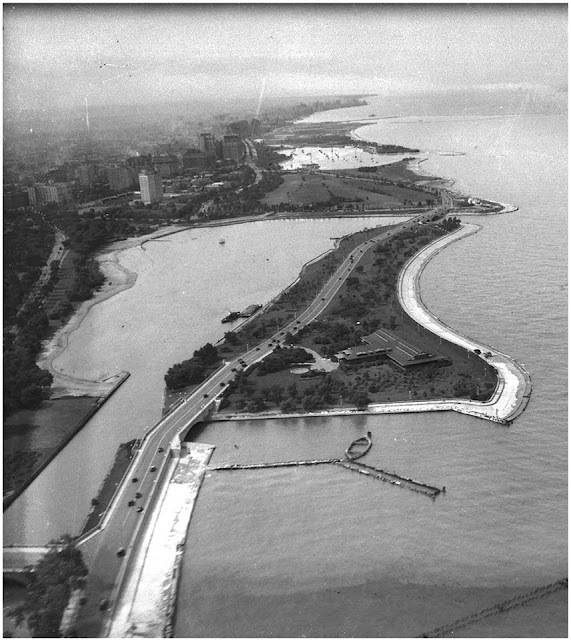 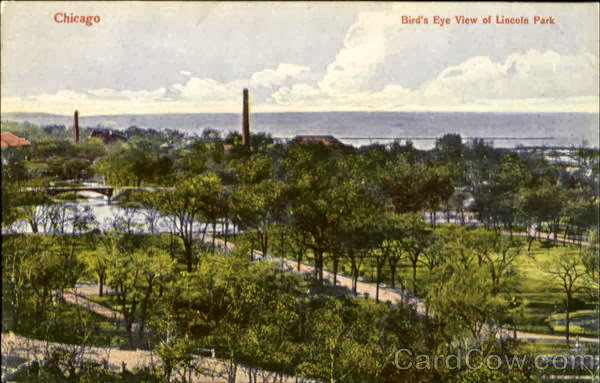 That one destroyed property along the lakefront including Potter Palmer's original North Lake-Shore Drive along with the existing street end-beaches. 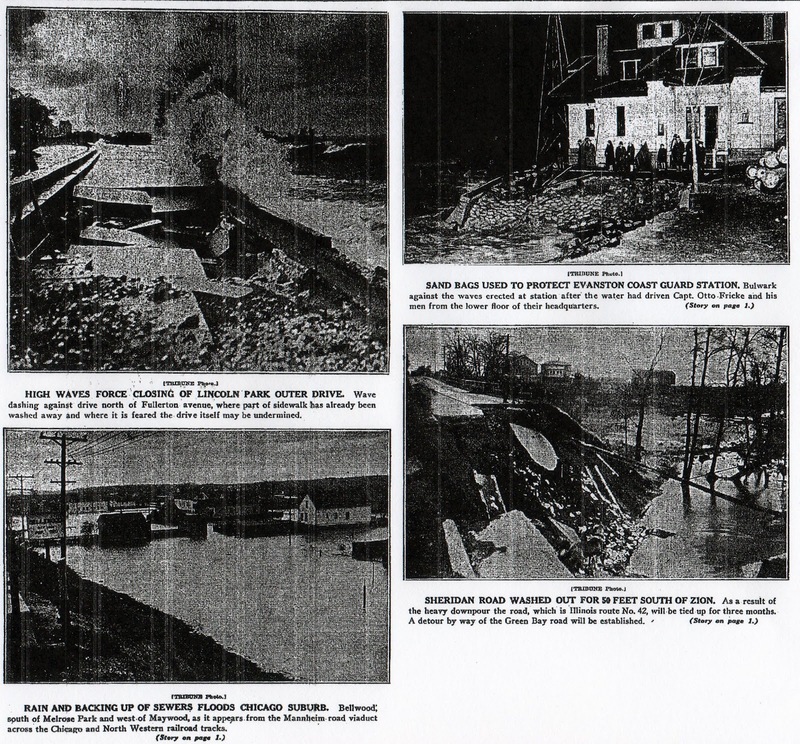 After the storm the U.S. government engineers needed to resolve the existing & the volatile lake water levels of the past decades along with the storm damage that destroyed public & private property along the lakefront. 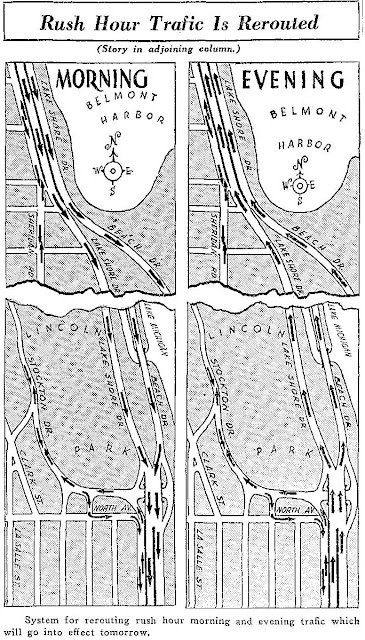 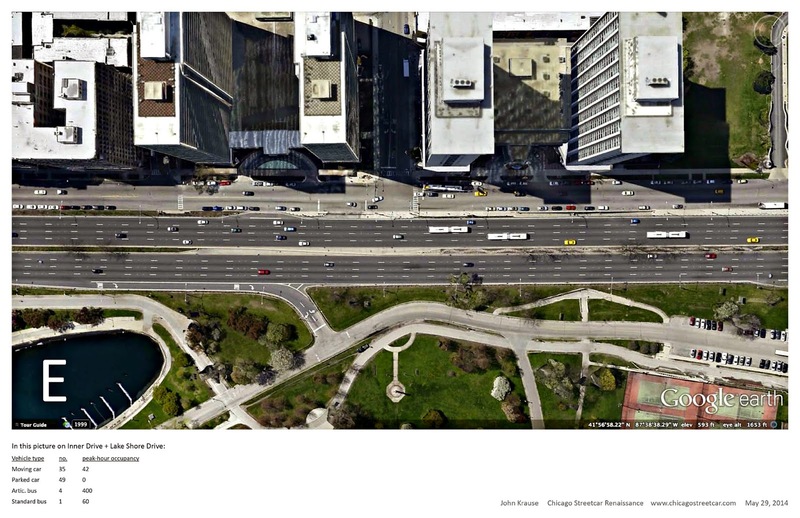 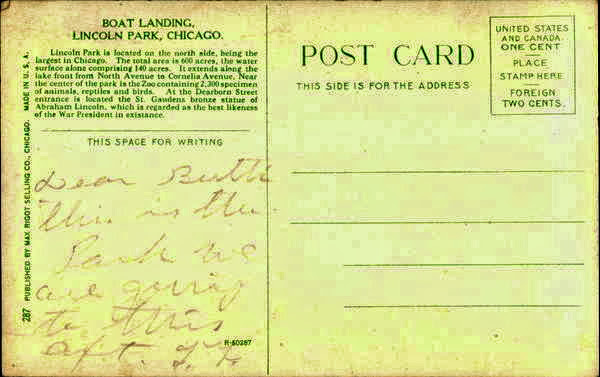 The other issue was Lincoln Park, the park, was the link between the south & north segments of LSD. 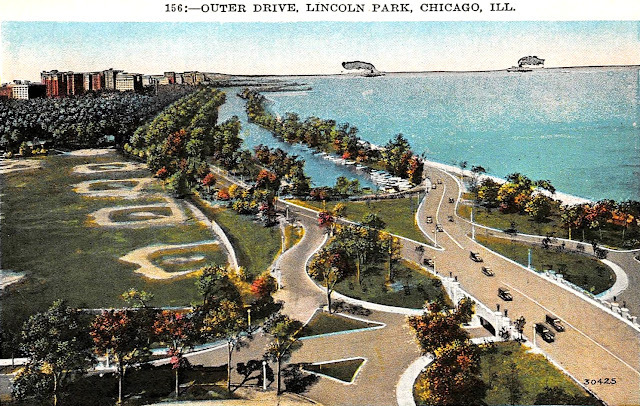 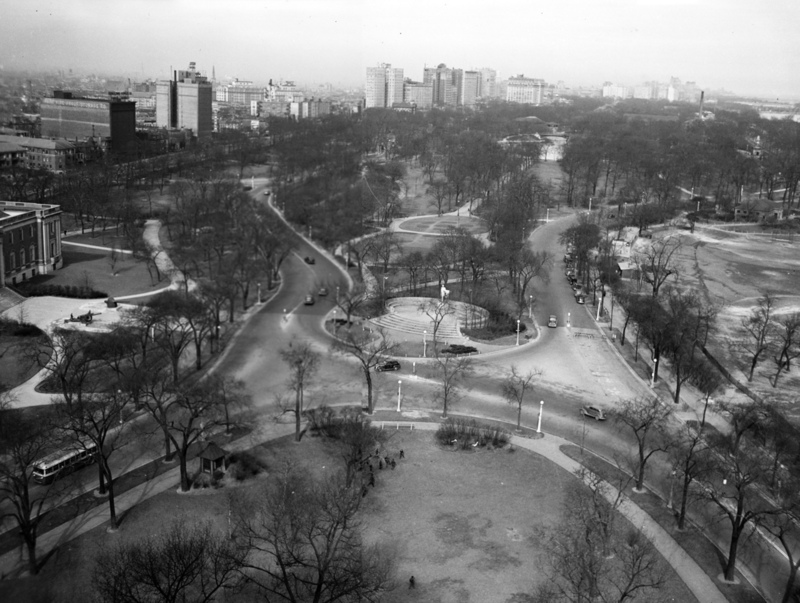 The park & its meandering walk-able roads were redesigned during the early by 1940 to accommodate for the wider street lanes, high lake water levels and more traffic. roadway and boardwalk along most of lakefront. 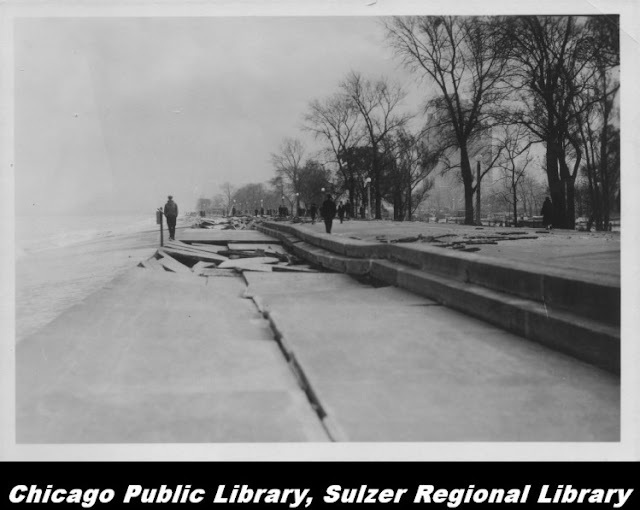 The photos below tell the tale of destruction along the lakefront from North Avenue to Belmont Harbor. 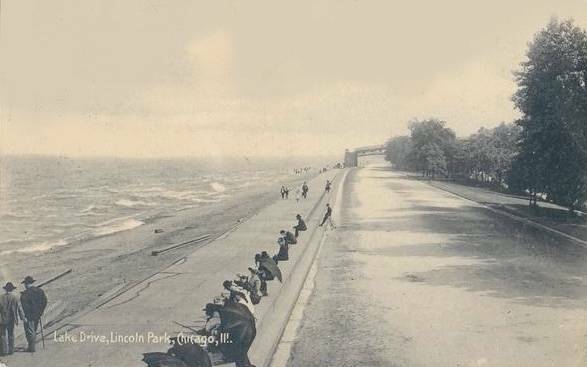 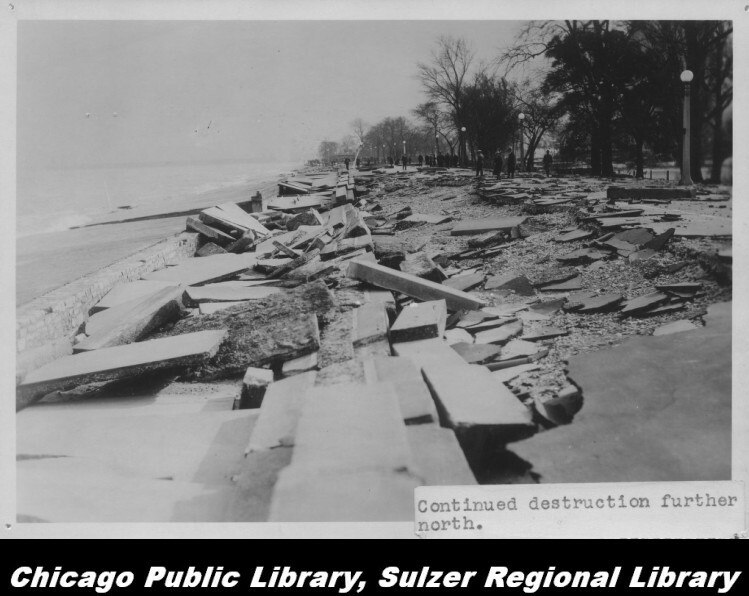 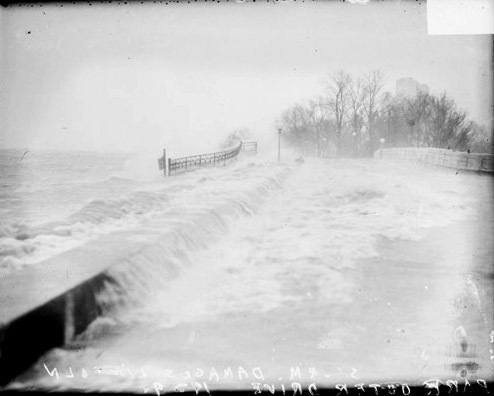 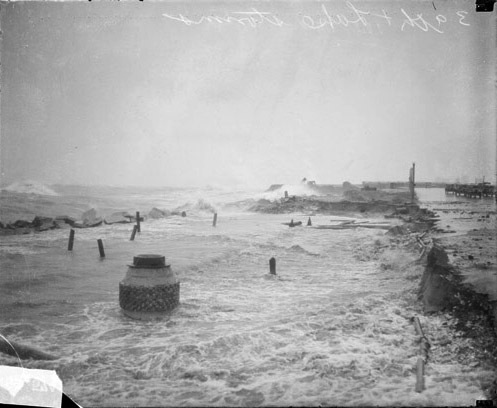 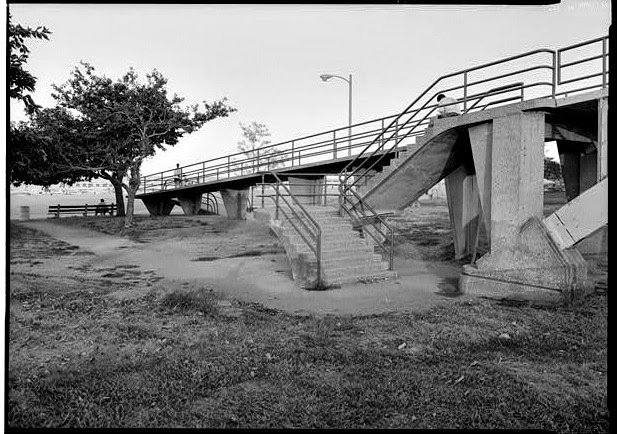 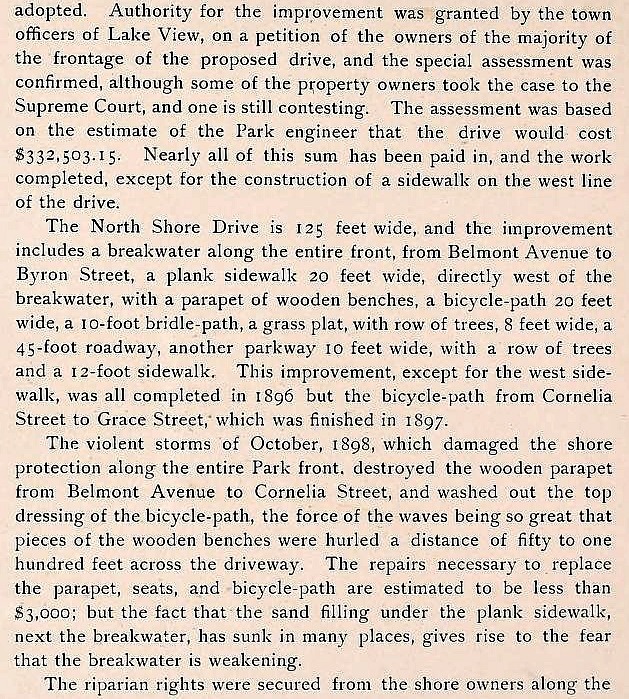 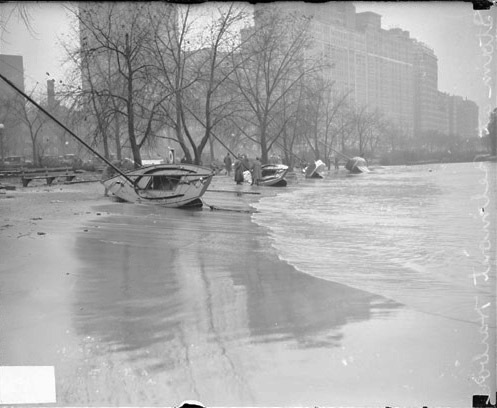 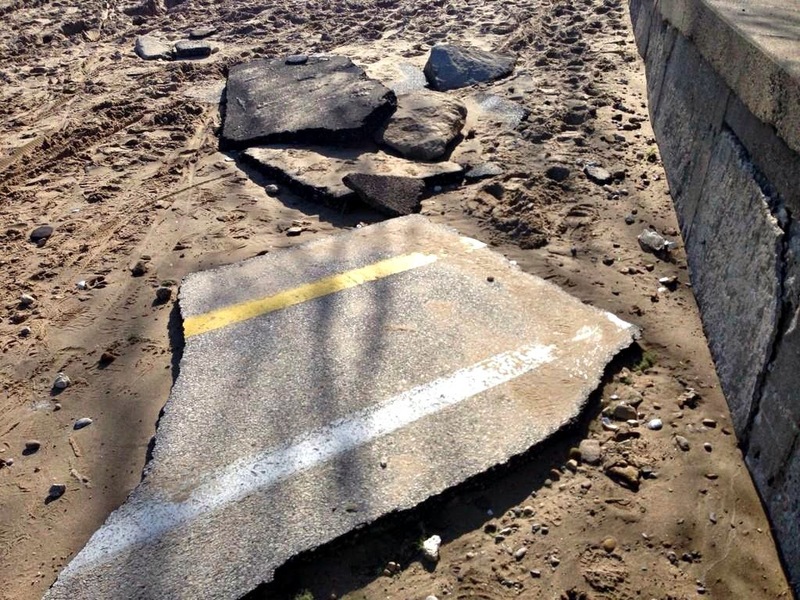 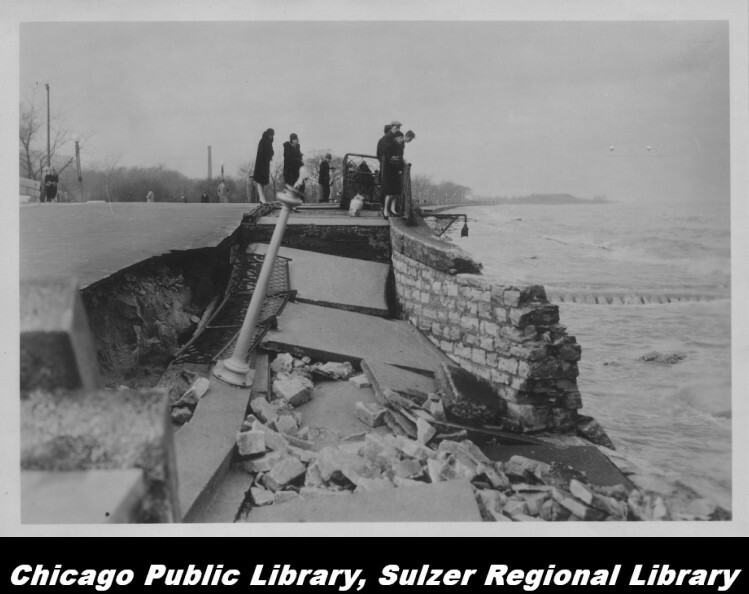 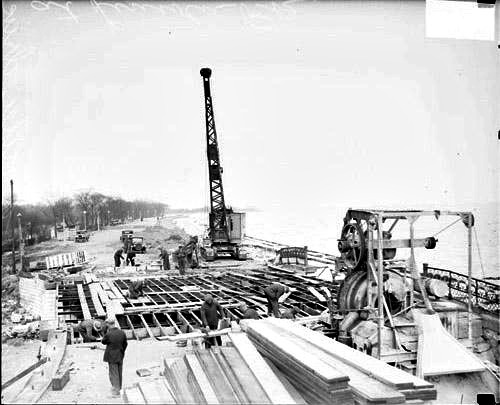 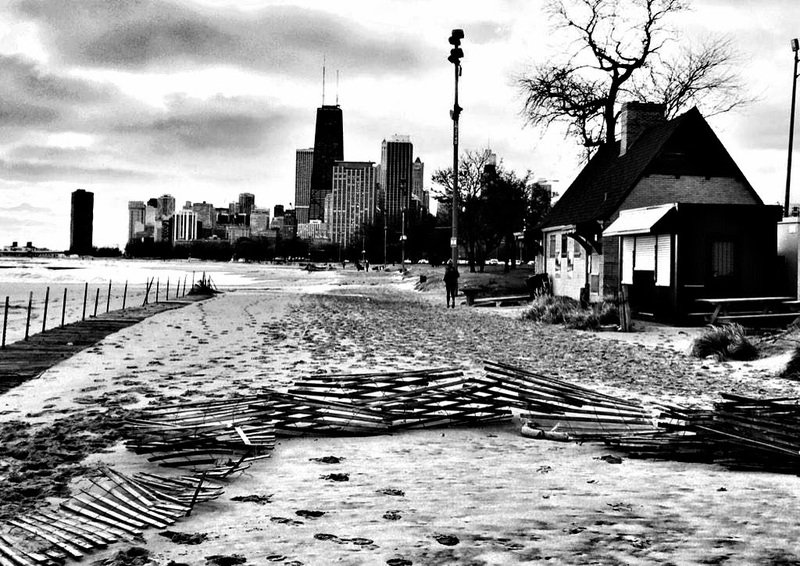 The roadway link through the park that connected North Lake-Shore Drive south and north of the park to Belmont Avenue - 'Breakwater Carriage Drive and Sidewalk' was totally destroyed by the crashing waves of the lake. 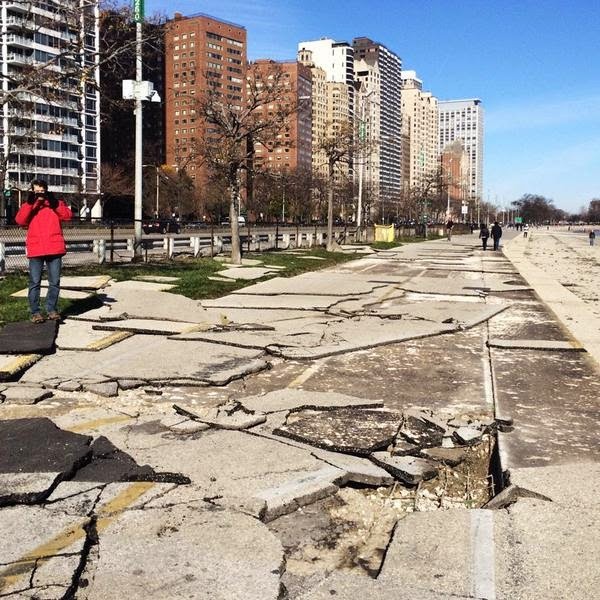 As a side note: The storms still cause damage to the lakefront no matter what man-made changes are made as a day in October 2014 can attest. 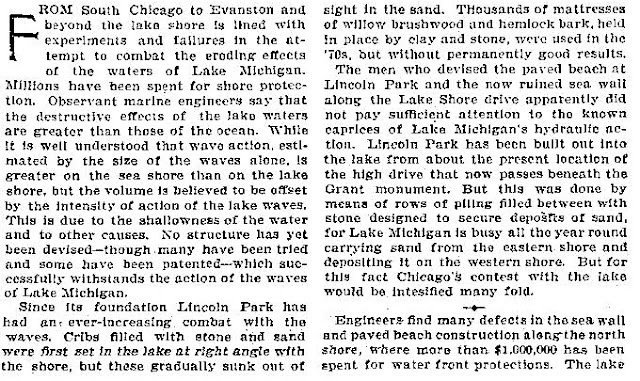 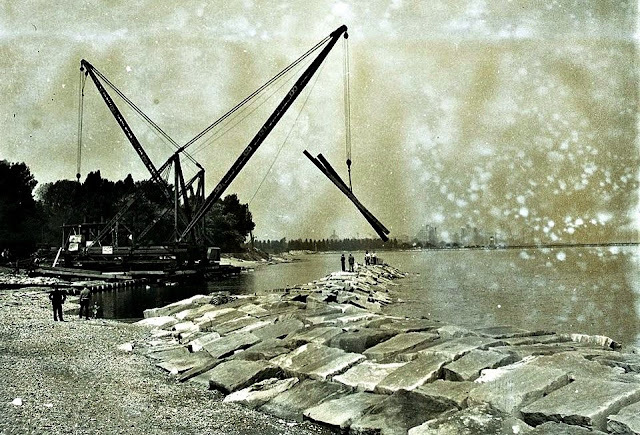 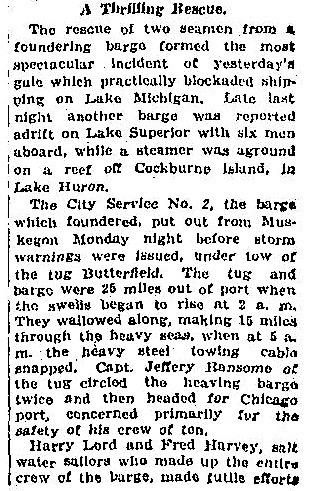 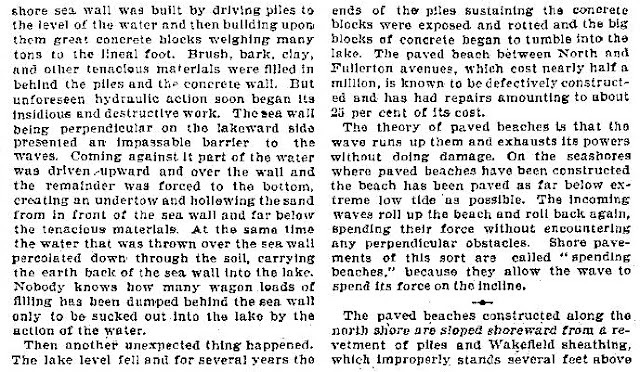 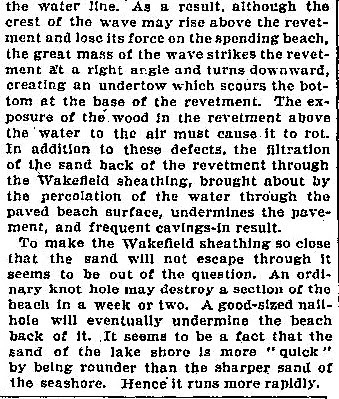 But this was not the first time Lake Michigan decided to make war with the man-made modifications with this article below telling that story. 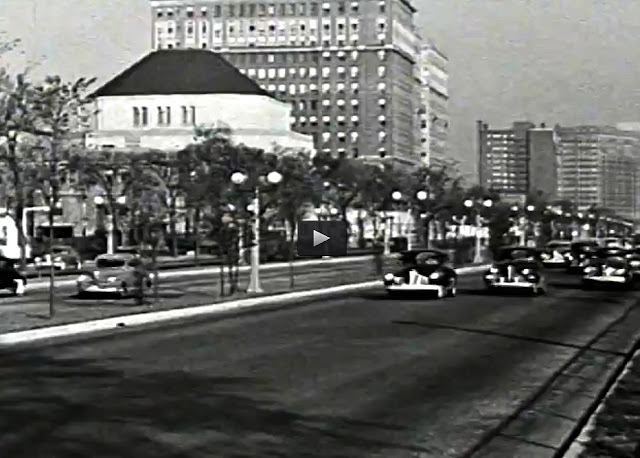 View and listen about the WPA and their mission. 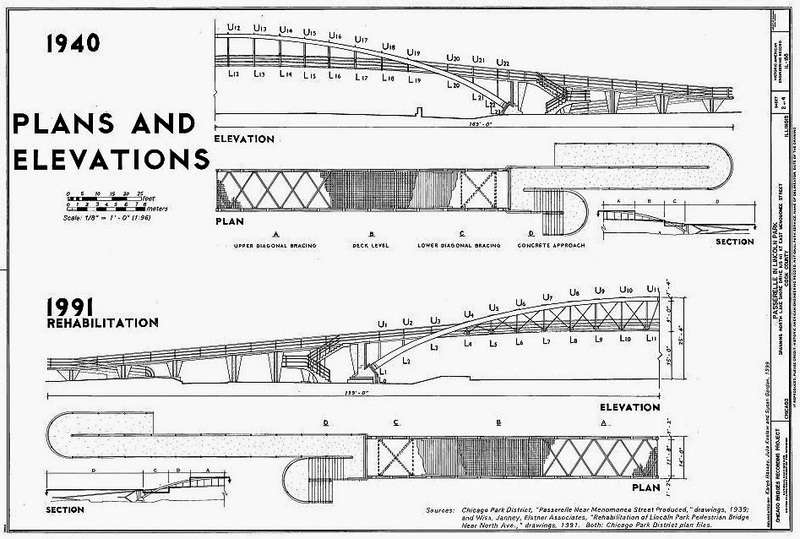 Some plans never get off the drawing board. 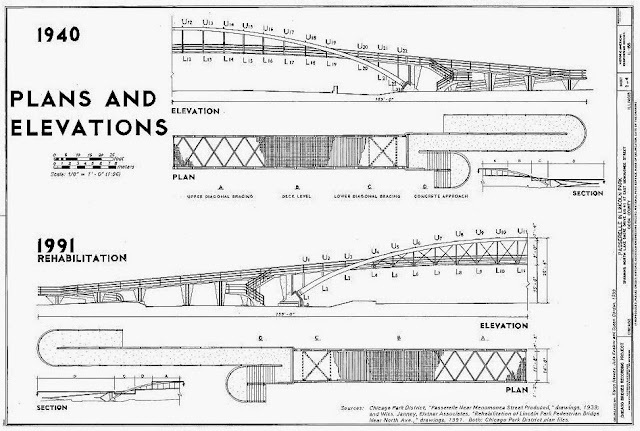 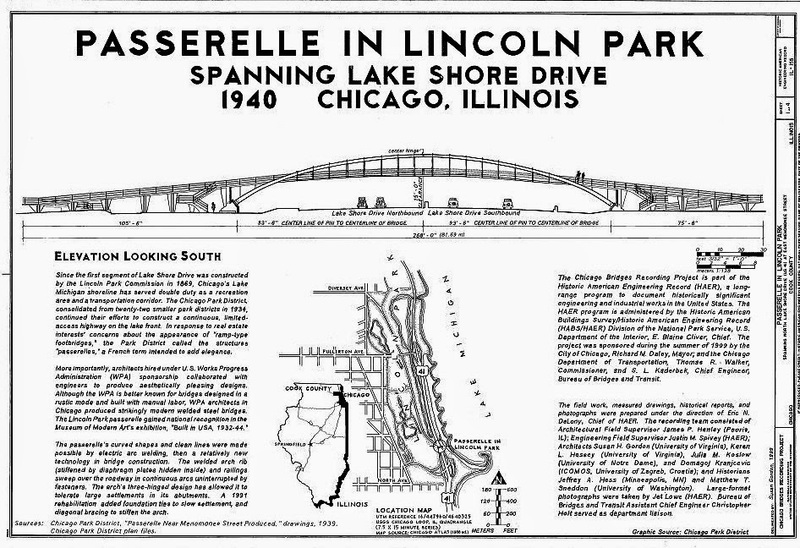 According to 1940 publication called ‘Chicago Bridges Recording Project’ for the extension of Lake Shore Drive northward to Foster Avenue there was an ambitious plan for the Belmont Harbor area that showed six "ramp type passerelles" or catwalks much like the pedestrian bridge much like the one at North Avenue. 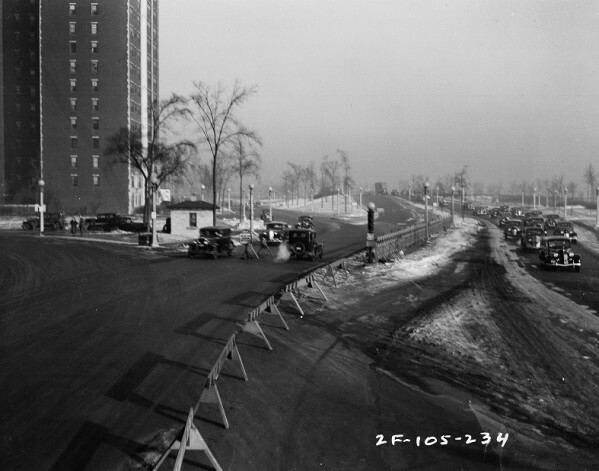 This plate-girder construction across North Lake Shore Drive was to be at every other cross street from Briar Place to Grace Street bridging the residents with the shore. 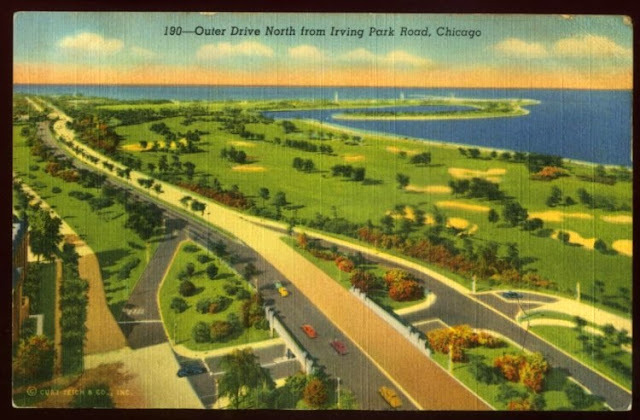 Complaints from local real estate and business organizations resulted in the developers to build only two of the crossings -at Briar Place and Aldine Avenue but as pedestrian subways or in other words not over but under Lake Shore Drive. The only passerelle to be constructed over LSD was at North Avenue - due to the park's greater width at that location and/or perhaps because of the designs’ space & shape that allowed a more elegant arch form of construction. 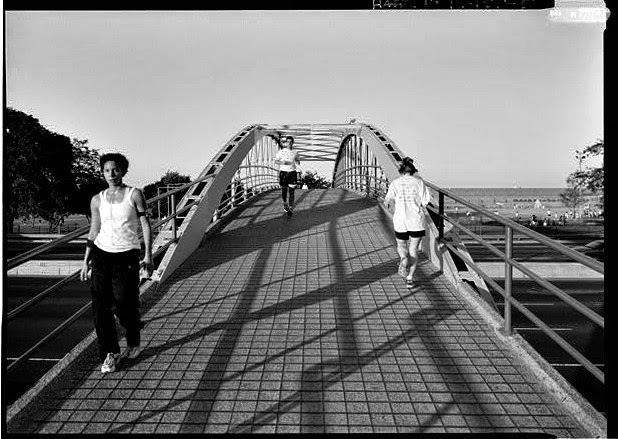 The passerelle design won praise from New York’s Museum of Modern Art by its construction phase 1938-40. 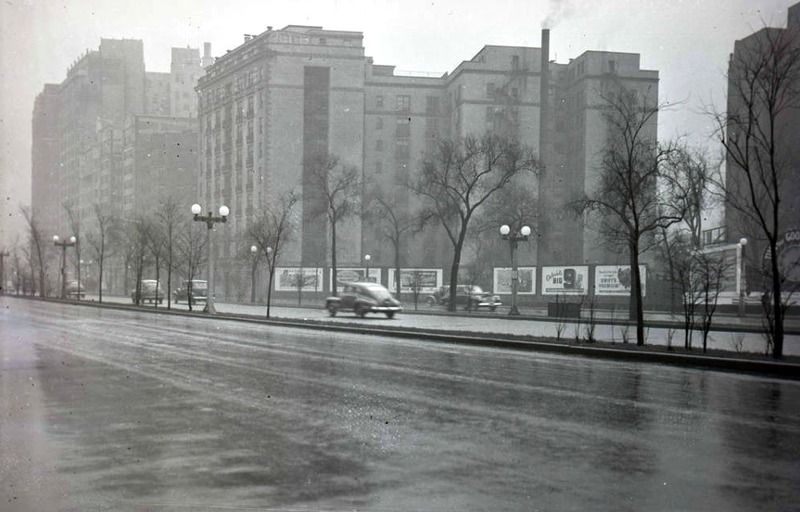 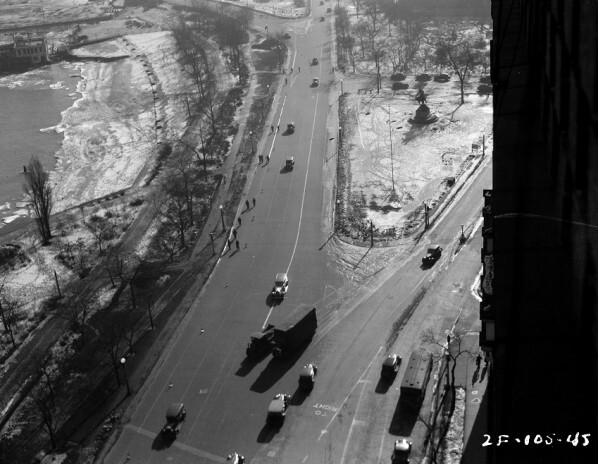 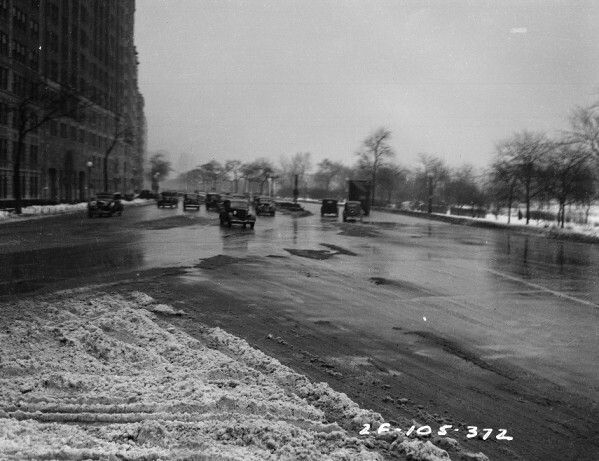 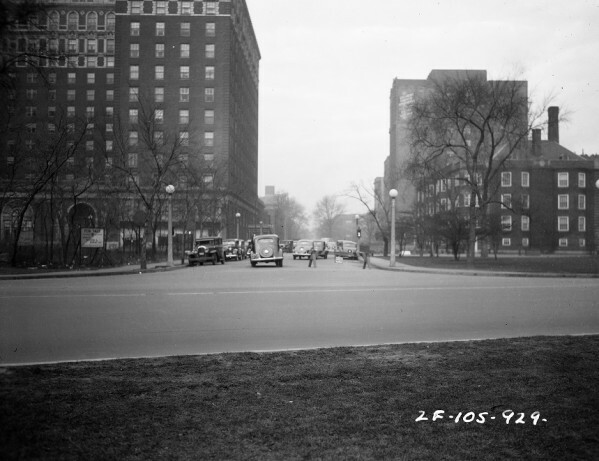 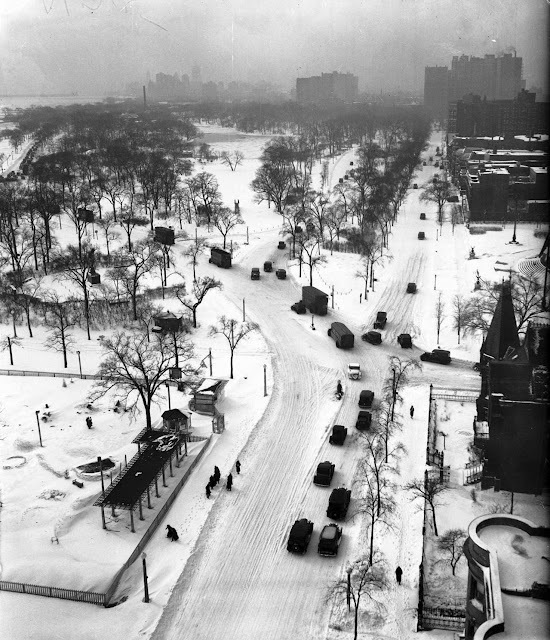 In the 1937-1942 (WPA) Federal assistance program expanded North Lake Shore Drive (LSD) to Foster Avenue to the north and Jackson Park to the south. 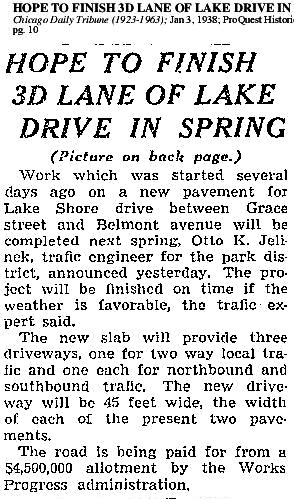 LSD is widen and expanded from LaSalle Street to Lawrence Avenue - once called Lawrence Drive at the time. 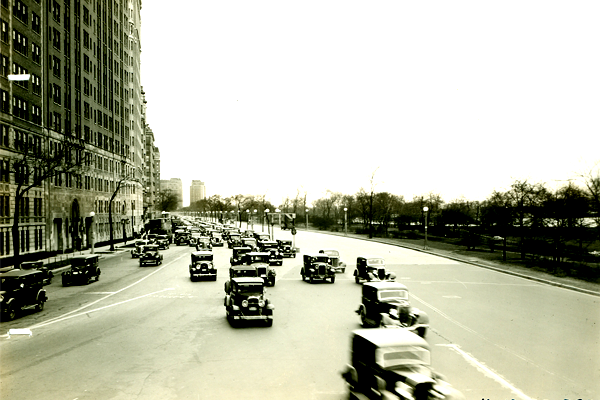 The 'folk in the road': Inner LSD (Sheridan Road) towards Lake Shore Drive southbound. 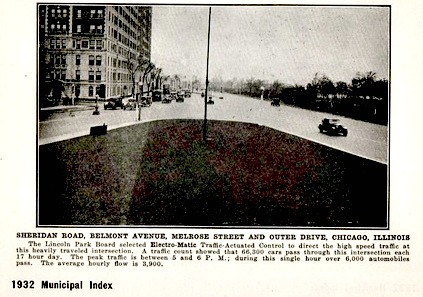 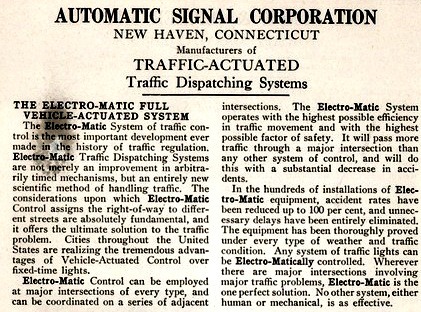 Notice that Belmont Bridge was not yet constructed - that was done in 1942. 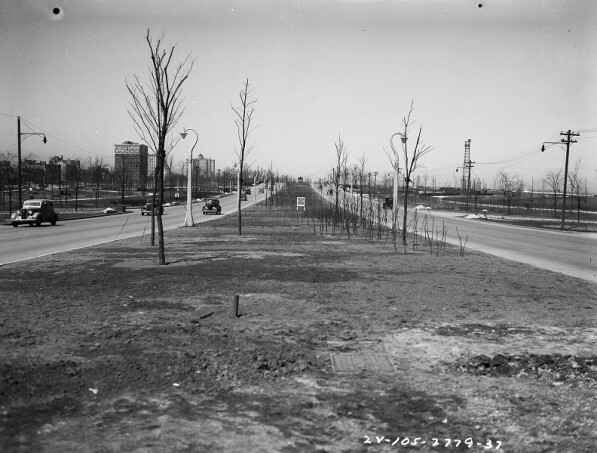 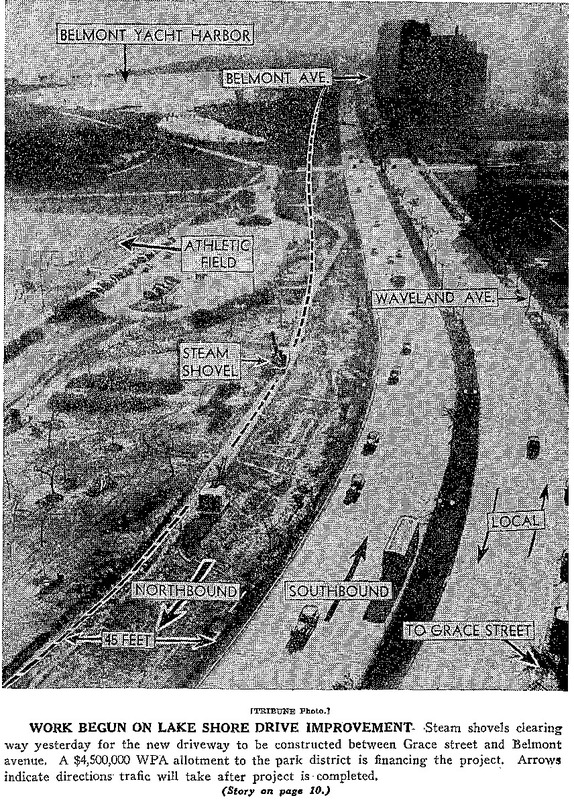 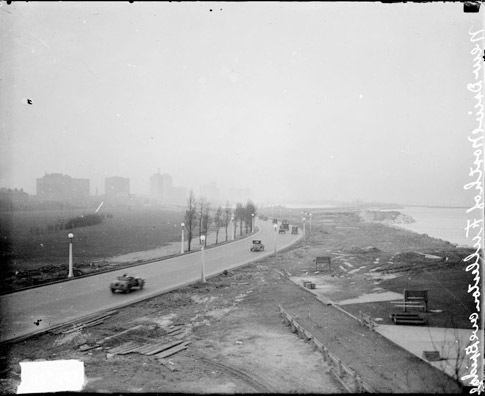 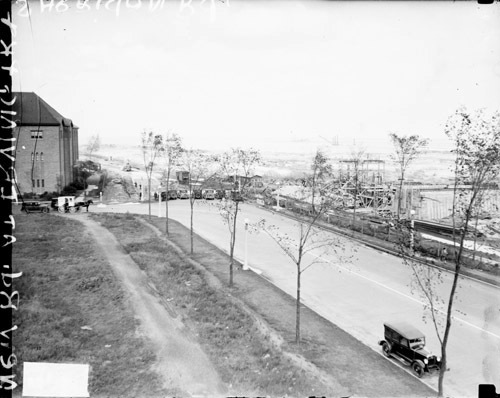 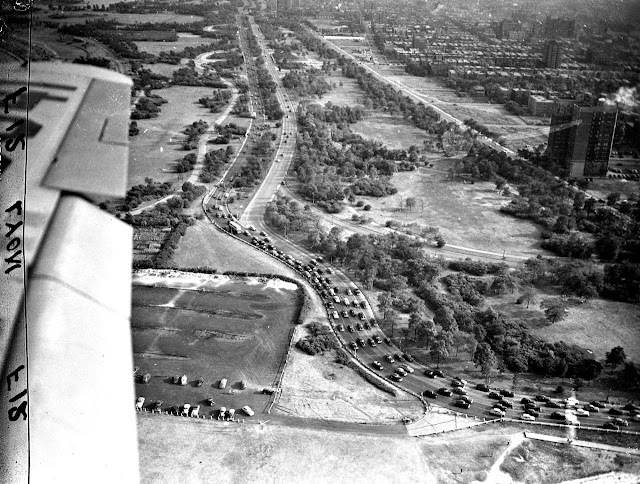 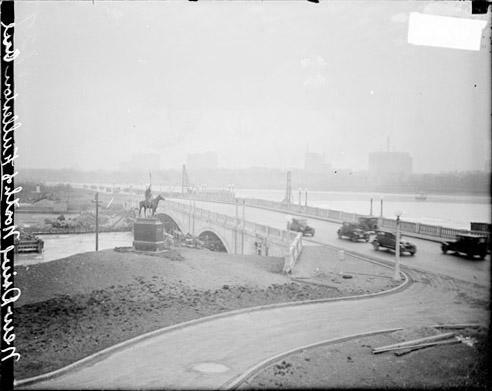 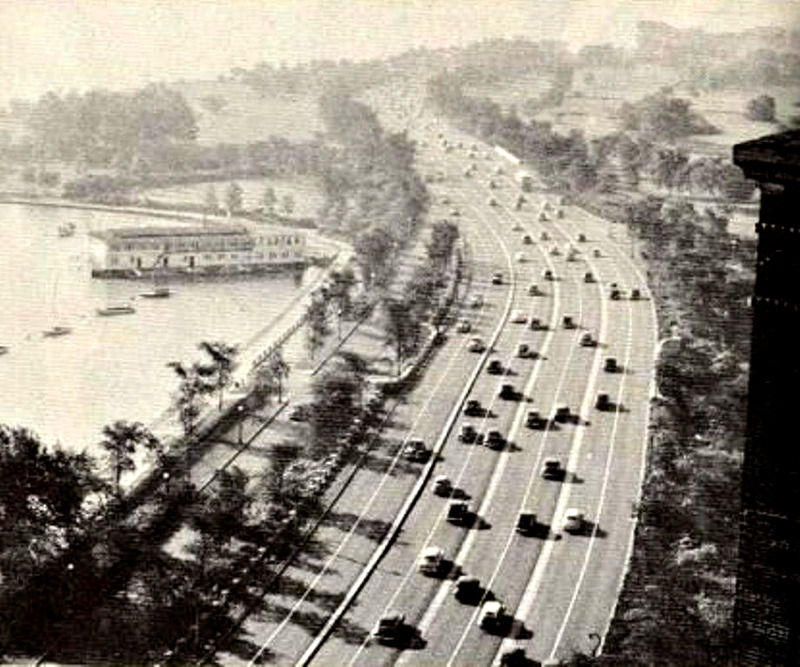 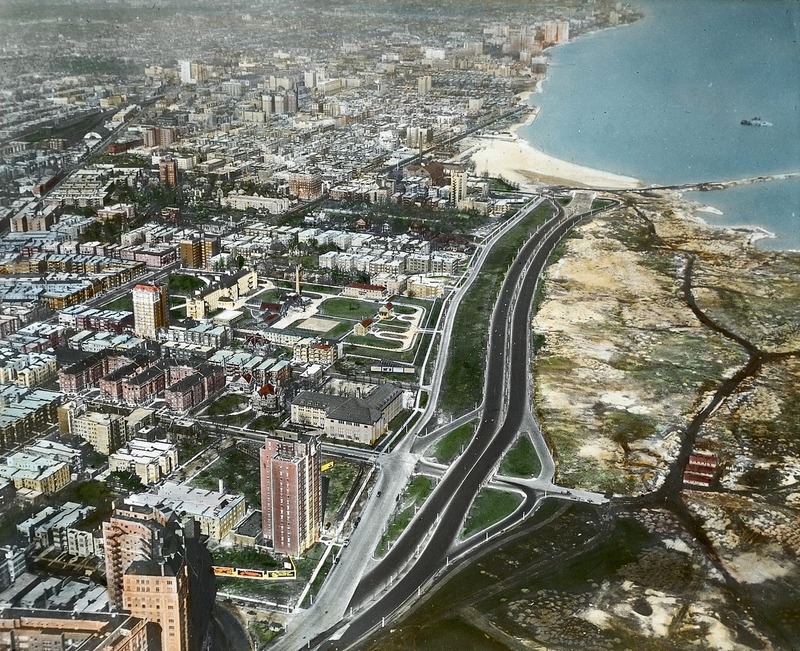 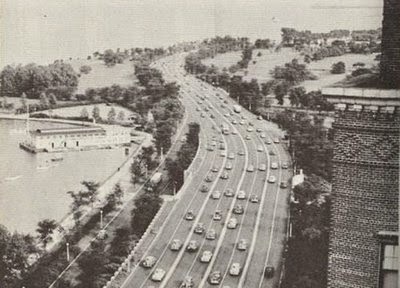 The separation from inner LSD (Sheridan Road) and the new Outer LSD at Byron Place by 1937. 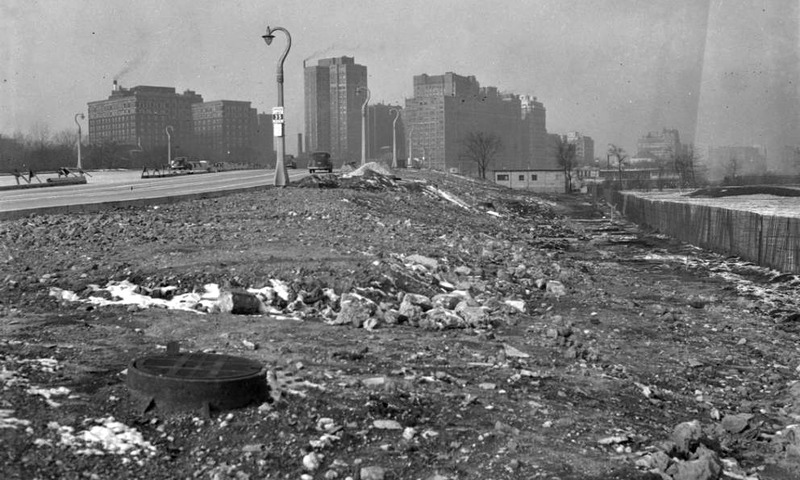 With this amount of landfill indicates to me that this area was originally on a bluff. 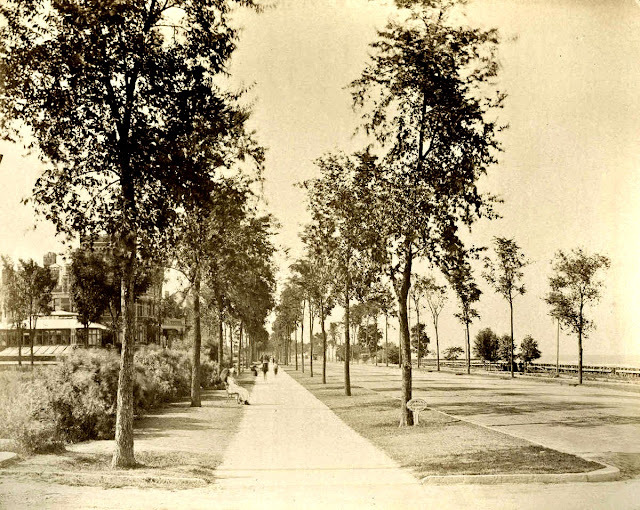 Sheridan Road as it did in old Lake View. 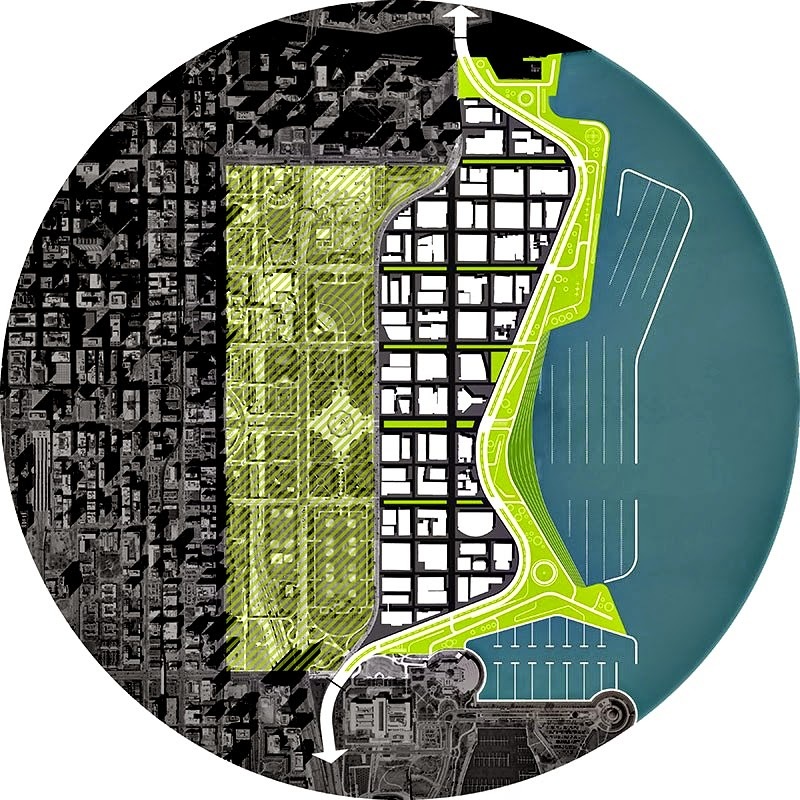 This idea is based on the need to create more city assets. While the NLSD project redesigns the Drive on existing land the BSC creates more land to the east of the existing roadway into the lake once again as it did in the early 20th century - creating 225 acres of prime real estate. It has been done before but can we do it again? 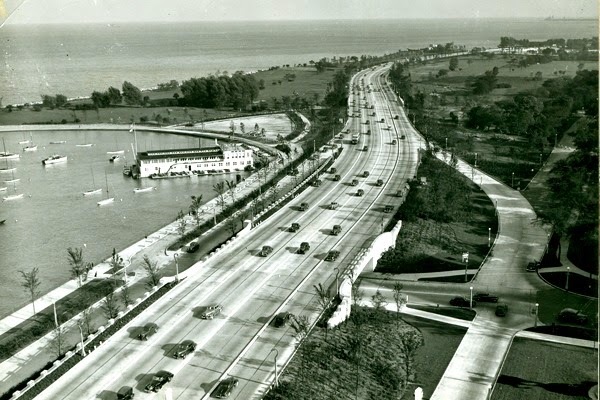 This proposed project involves improvement of seven miles of the 8-lanes of North Lake Shore Drive from Grand Avenue to Hollywood Avenue, including the 12 highway junctions. 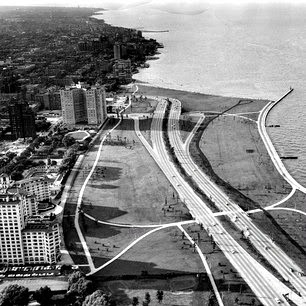 The junctions are those locations where major cross streets intersect Lake Shore Drive & where access is allowed through the Outer Drive. The project will continue to evaluate the condition of the 22 bridges and tunnels along the Outer Drive as well as the operation of the Inner Drive. 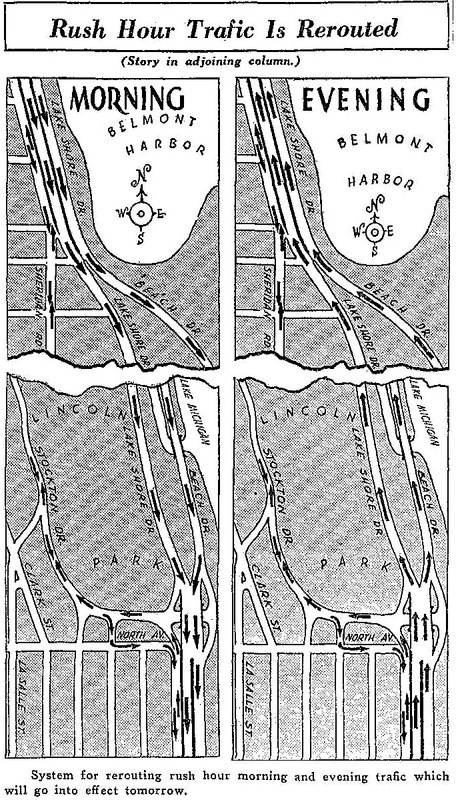 three geographic subgroups of stakeholders. 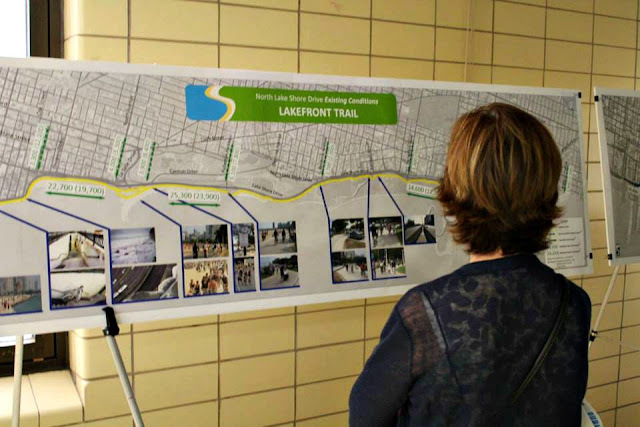 This group will be comprised of residents and stakeholders addressing issues from this section of the NLSD project, including the 2nd, 42nd and 43rd wards. 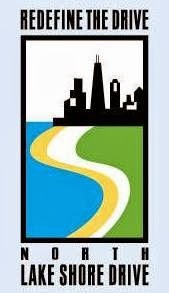 This group will be comprised of residents and stakeholders addressing issues from this section of the NLSD project, including the 43rd and 44th wards. 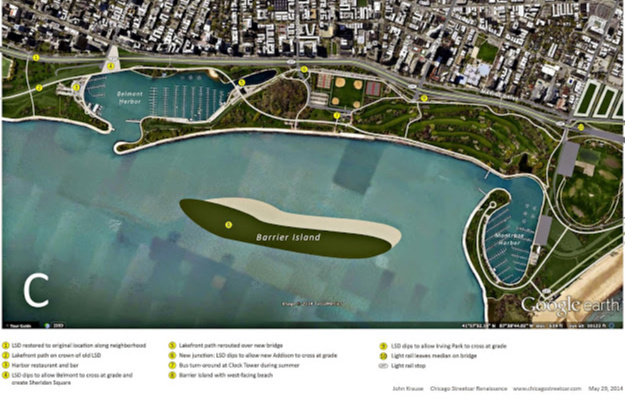 This group will be comprised of residents and stakeholders who will address issues from this section of the NLSD project, including the 46th and 48th wards organizations. 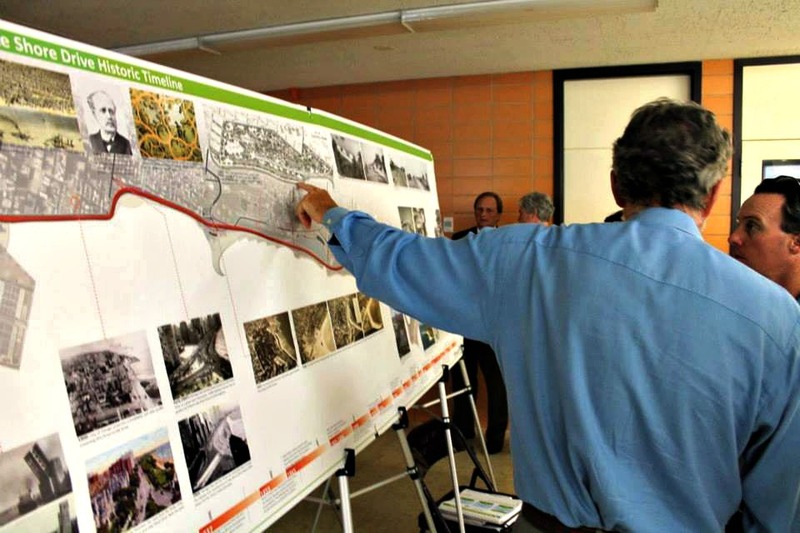 In order to get involved in a project that may take decades in the making. 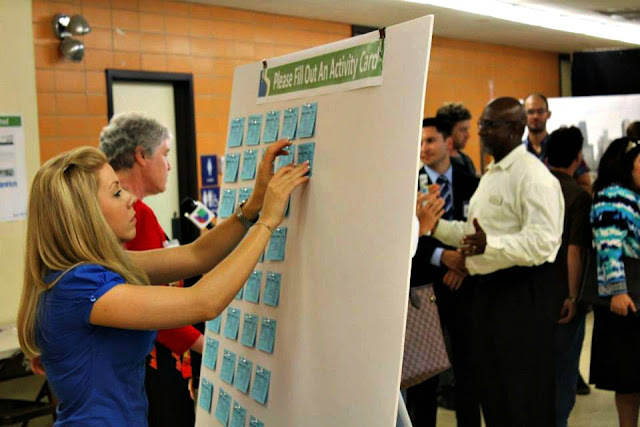 Follow the progress on Facebook. This was an apparently drainage system that collected rain and overflow lake water. 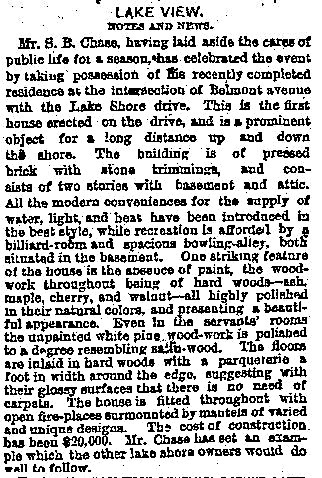 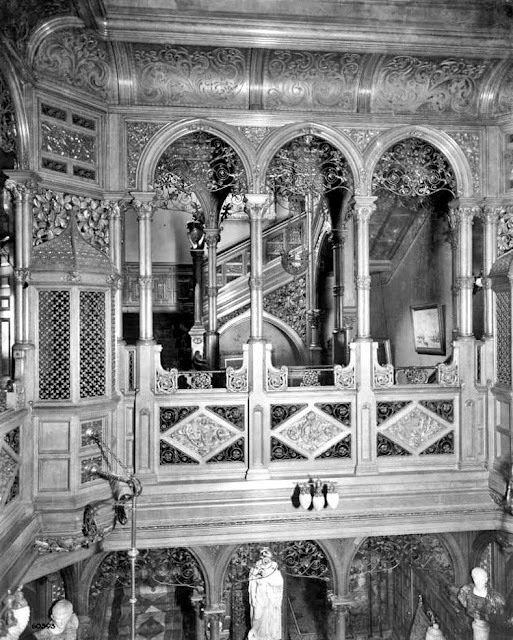 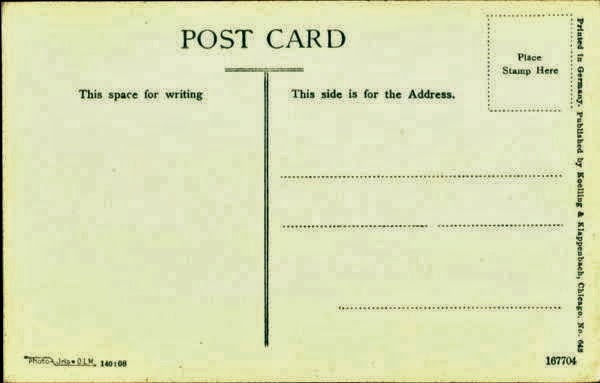 It existed well through the 19th century. 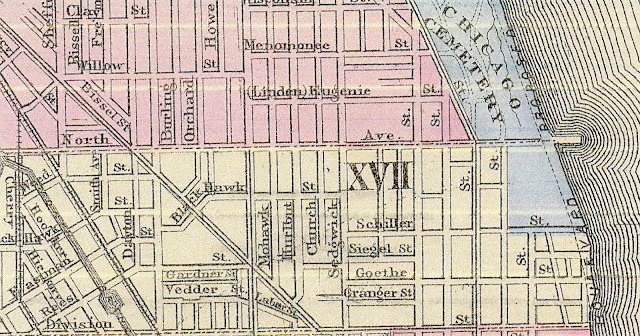 The section maps are from south to north. 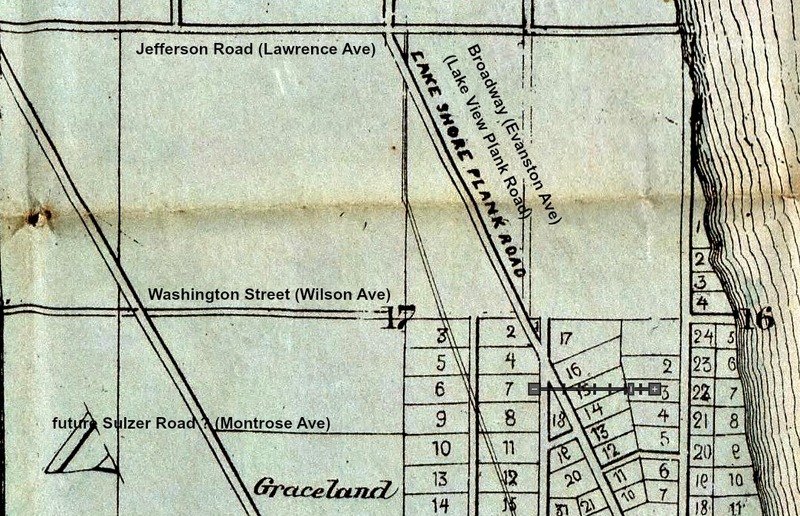 to Lawrence Avenue where it ends for some reason. 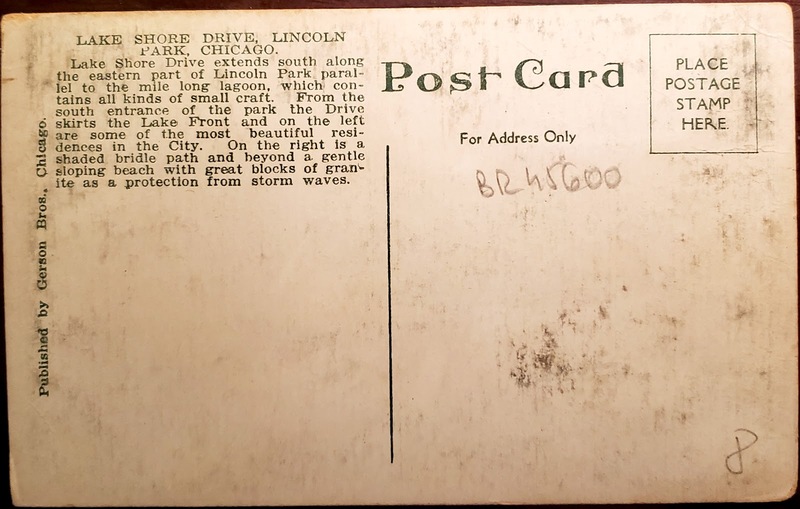 It would appear Clark Street while once called Green Bay Road was also called Graceland Road ... that is currently called Irving Park Road from east to west. 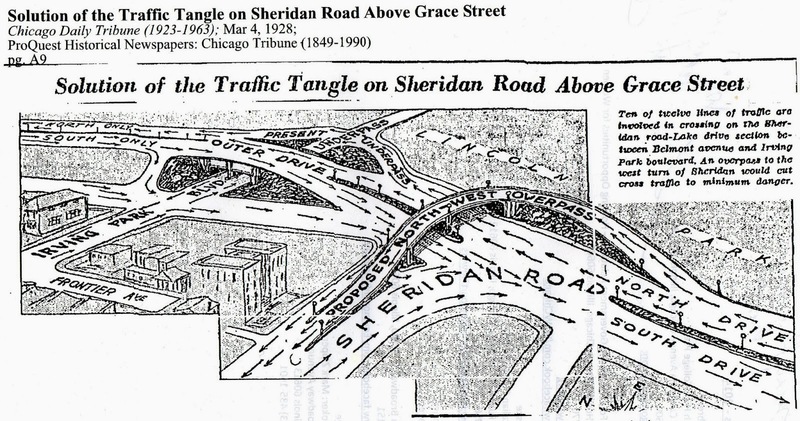 In Lake View's history of Drive and Sheridan Road are inseparable - what happened to one of the roadways happened to the other. Read about the blending history of this roadway with Sheridan Road. View the countless photographs of Outer Drive via Flickr. 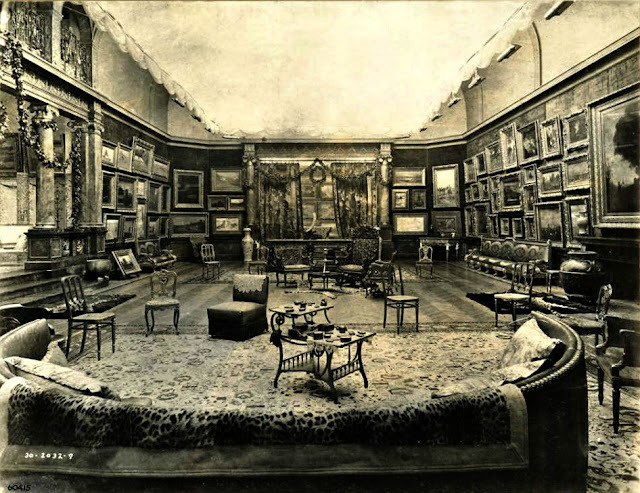 Also, view some selective photos of the history of the entire Drive from the Chicago Tribune. 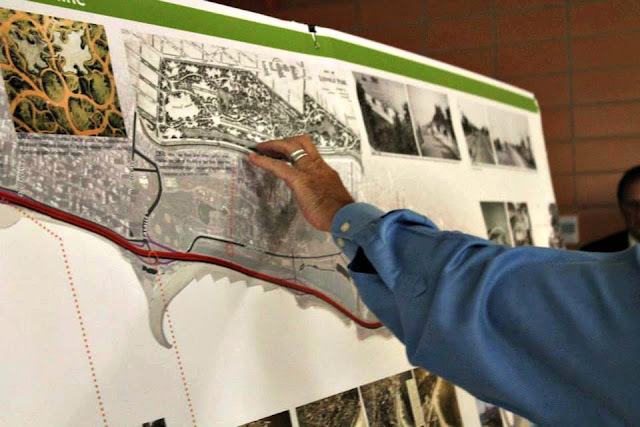 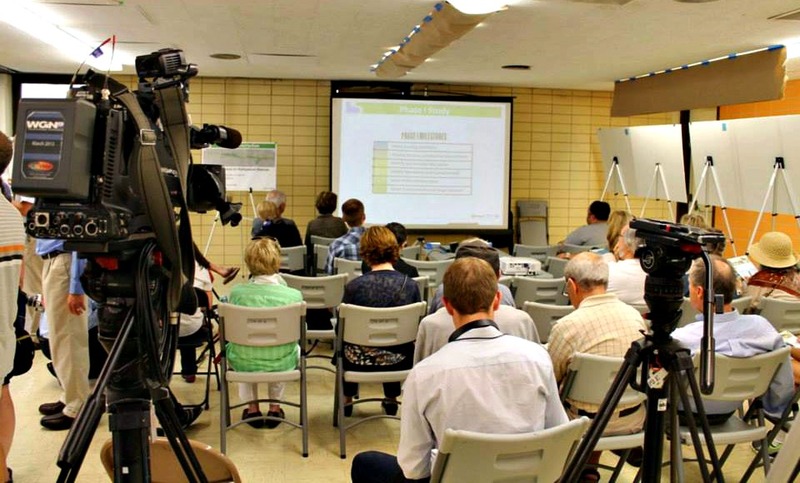 Read with this link expansion further south along the former steel mills of the far southeast side of the city with a plan to create a new neighborhood with this new extension.